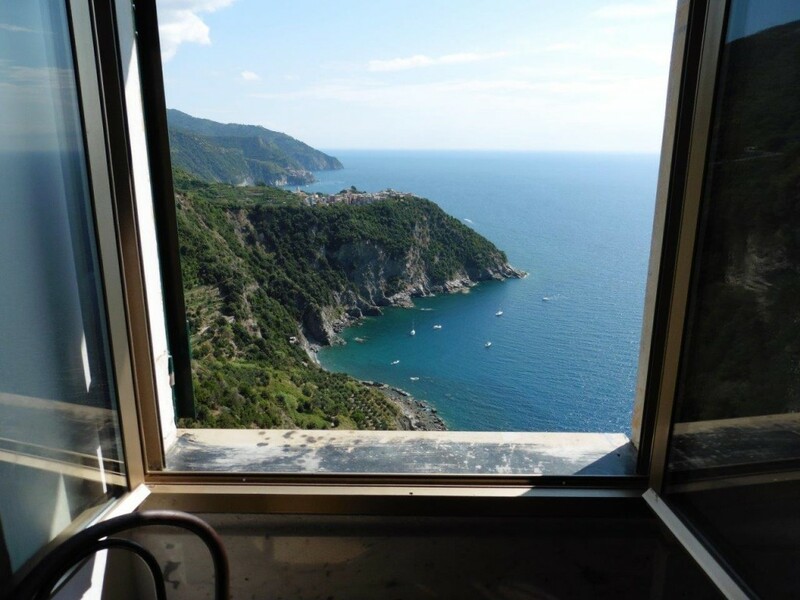 Every view is a postcard! 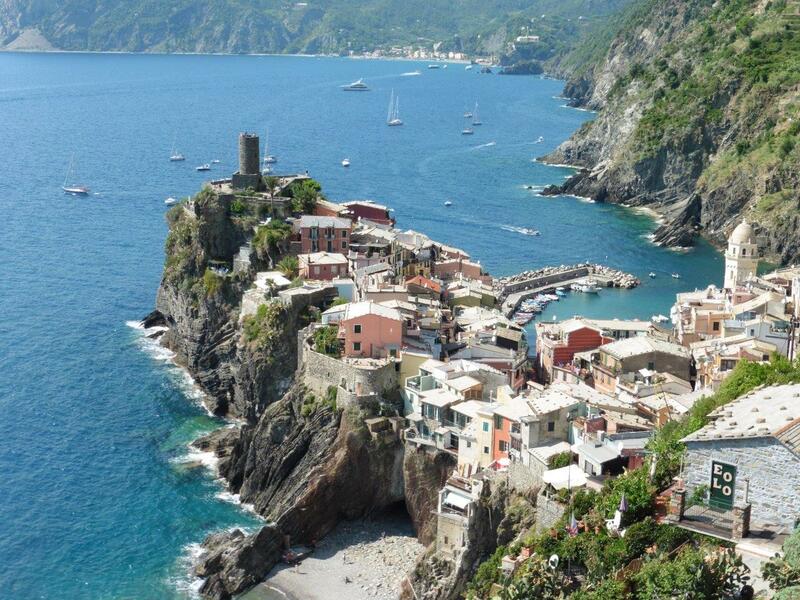 Cinque Terre, the area of five hill-side towns on the Italian Rivera, is one of the most beautiful places in the world. Traveling by bus, train and boat, we were able to hike the trails and visit all five towns in one day. We hiked through vineyards and olive groves. We hiked up and down steep hills. 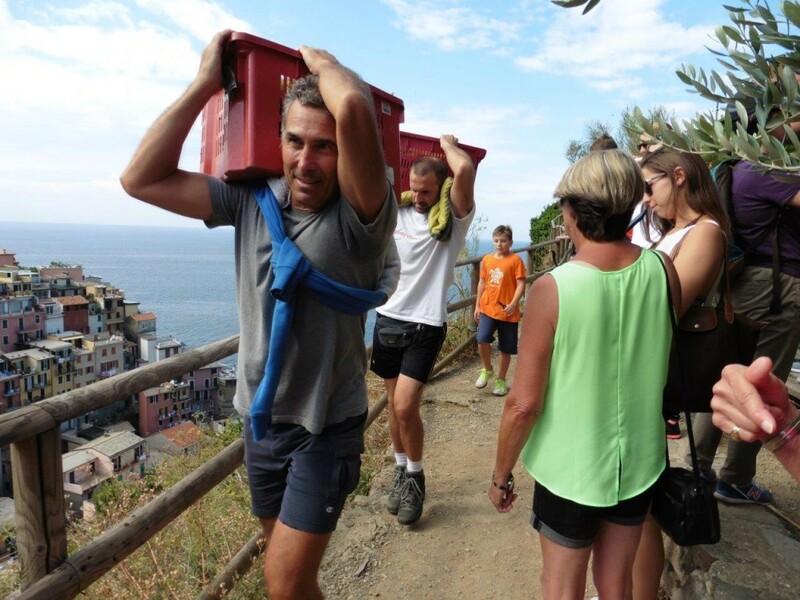 It was harvest time, and the trails were busy with workers hauling baskets of grapes on their shoulders. 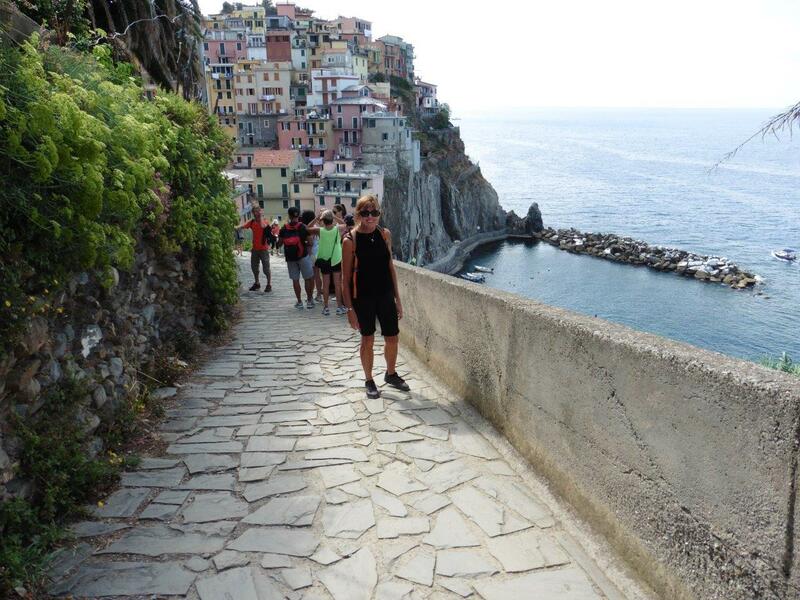 Our bus dropped us off in Manarola to begin our visit to the five towns. Daring swimmers were jumping off tall rocks into the Mediterranean Sea below. Our first short hike led us to Corniglia and lunch. 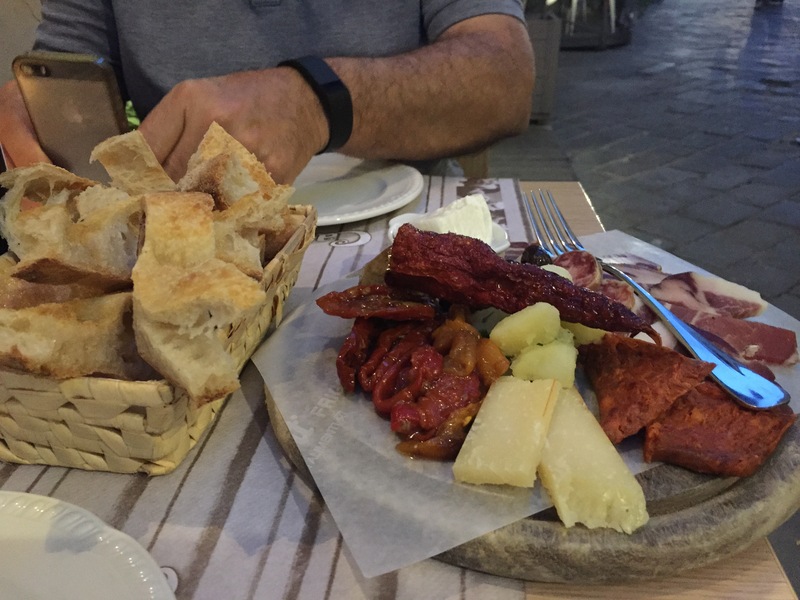 Sitting on a beautiful outdoor terrace, we dined on all types of local seafood. Our guide told us that the hike to lunch would be a test to see if we could handle the longer post-lunch hike. He pointed out our half-way point, a bright pink bar nestled in the hillside where we could get a drink and take a break. We were very hot and very dry when we arrived at the pink bar. We enjoyed a lemon fizzy made from the abundant local lemons and the gorgeous view of Corniglia in the distance where we started our long hike. 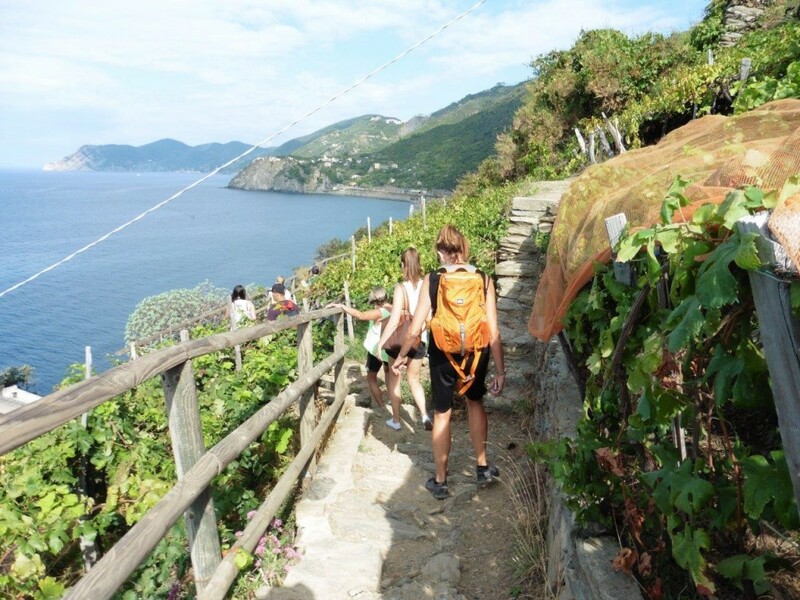 We continued the rest of our hike to Vernazza, and thrilled at the view as we approached the town. After a gelato treat and walk around the town, we boarded another train to Monterossa. The beach here was voted sexiest beach by Forbes magazine. 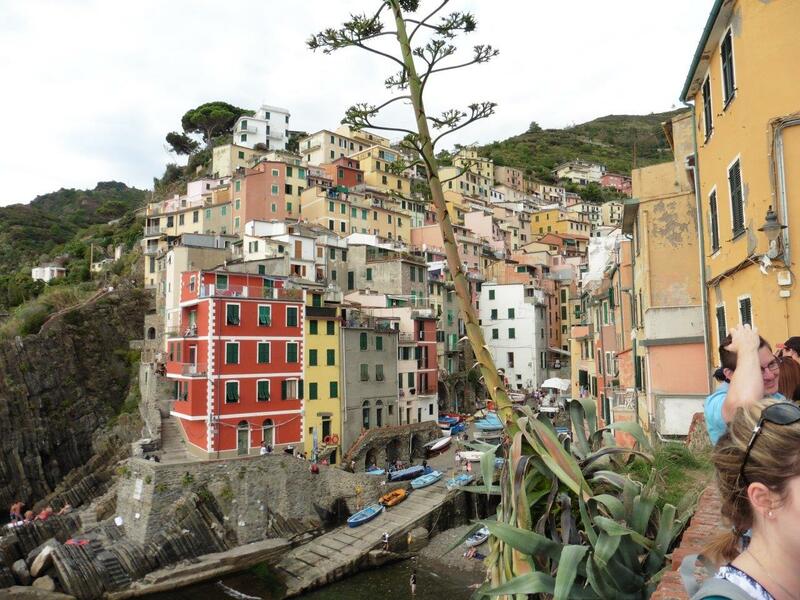 Cinque Terre is noted for its white wine, so we did a white wine tasting of one wine from each of the five towns. 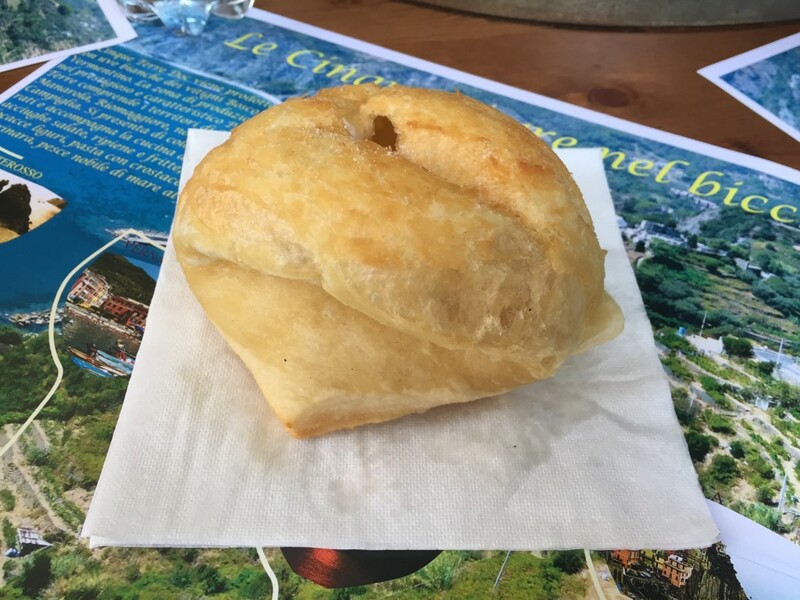 I got a pan fritto con formaggio, a pastry with cheese inside that is only made in Monterossa, to go with my wine. It tasted like an Italian version of something I would eat at the Minnesota State Fair and paired beautifully with my wine. 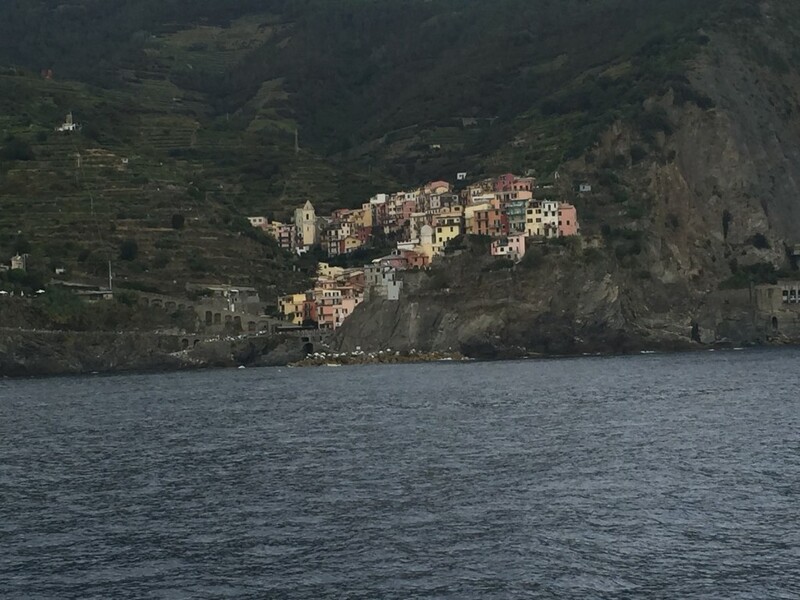 Taking a boat from Monterosso Riomaggiore, we were able to see the coastline of all five towns. 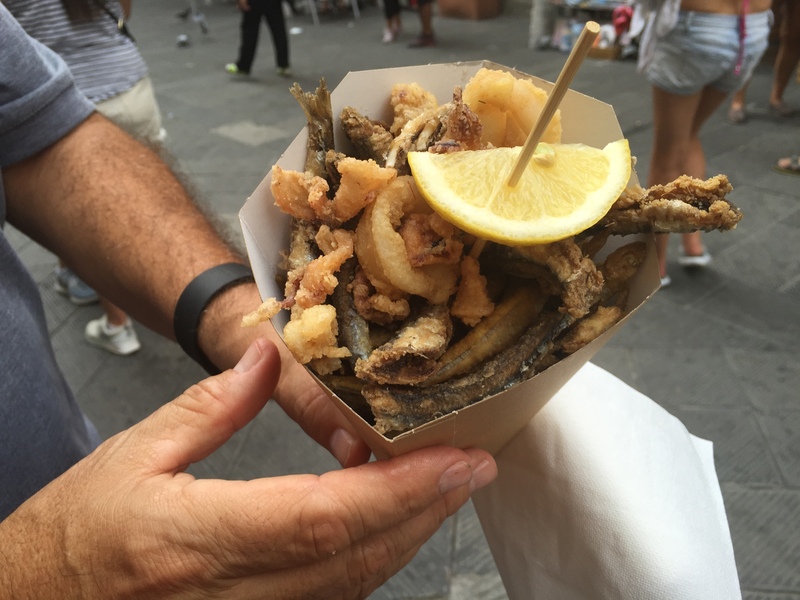 In Riomaggiore we wandered the lovely street (yes, singlular, there was only one) and sampled a cone of the local fried fish. Fabian, our guide, told us that the mayor of each village chose the house colors. He also warned us about pickpockets in the train station and would point and yell “pickpocket” when he saw one. 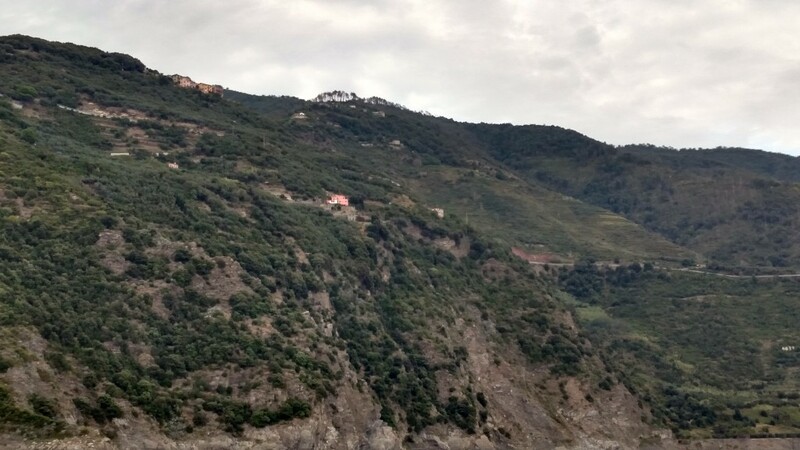 A final train ride to La Spezia to catch our bus home and our wonderful day in Cinque Terre was over. I definitely will return for a longer visit. This entry was posted in Italy 2015 on September 13, 2015 by debbie. 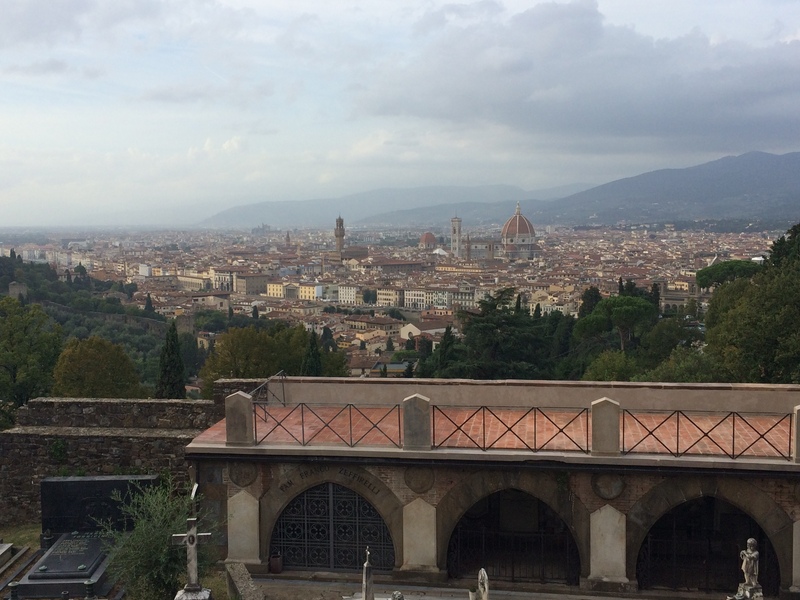 After a great week of enjoying Firenze, my girlfriends go home tomorrow. We spent their last day here shopping and dining. Lunch was at a delightful little shop around the corner from our apartment. As the server got out three glasses for wine, we reminded him that we only wanted two glasses of wine. 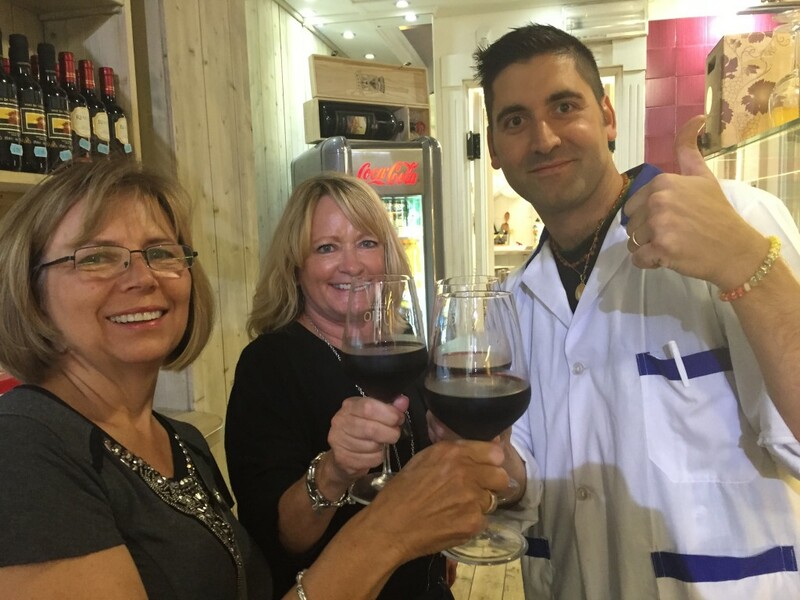 He smiled and said, “I know, the other glass is for me.” Then he came around the counter and clinked glasses with us. He introduced us to the owner who told us more about his shop. As we were leaving, they gave us little cookies. 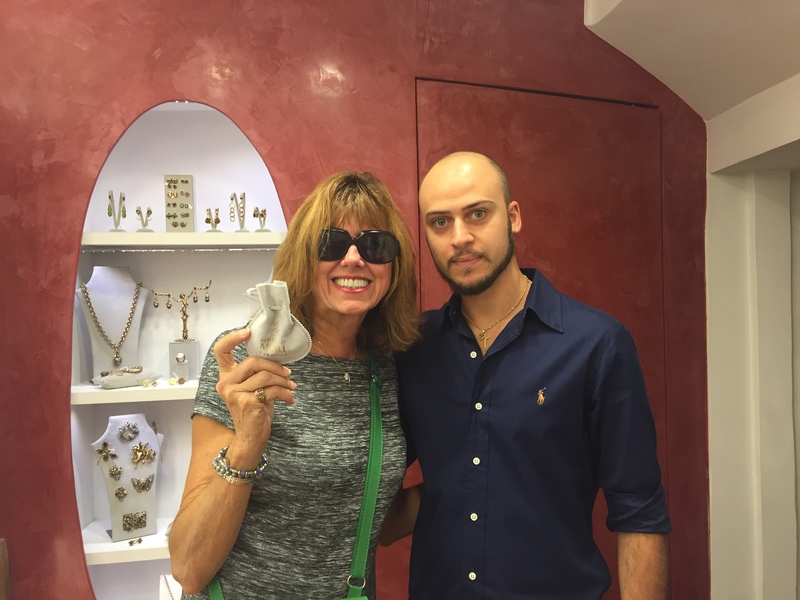 Shopping in the Oltrarno neighborhood, we found a wonderful little jewelry shop. 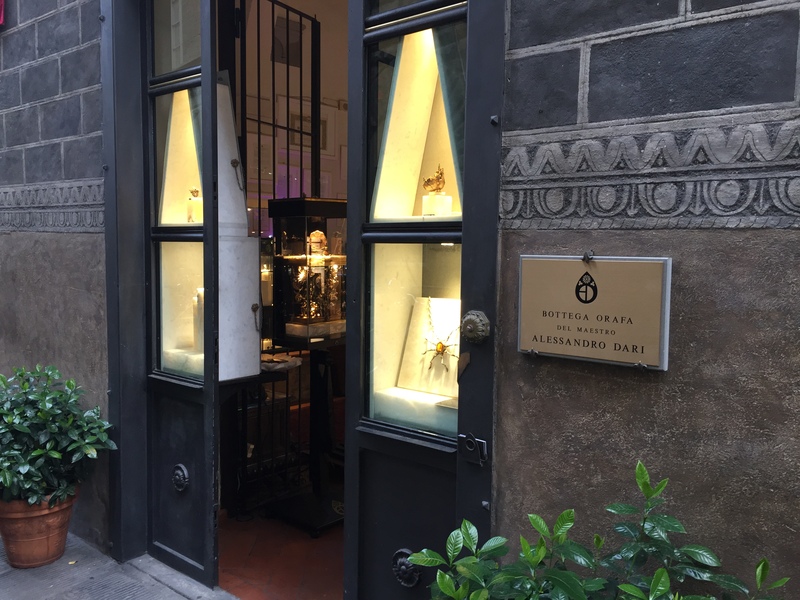 Florence is known for its gold jewelry, and jewelry stores are everywhere. The jewelry in this little shop was unique and hand-made in Florence. Although the jeweler spoke no English, he was able to communicate that he was the jewelry designer and his uncle was the owner. Knowing this made the jewelry we got there seem more special. Shopping for scarves, we met a most helpful vendor. 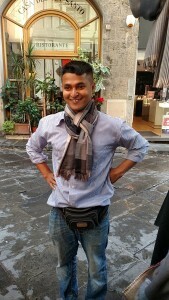 He showed us different techniques for tying scarves and kept improving the price on a purchase of multiple scarves. We left his stall with new skills and lots of scarves. 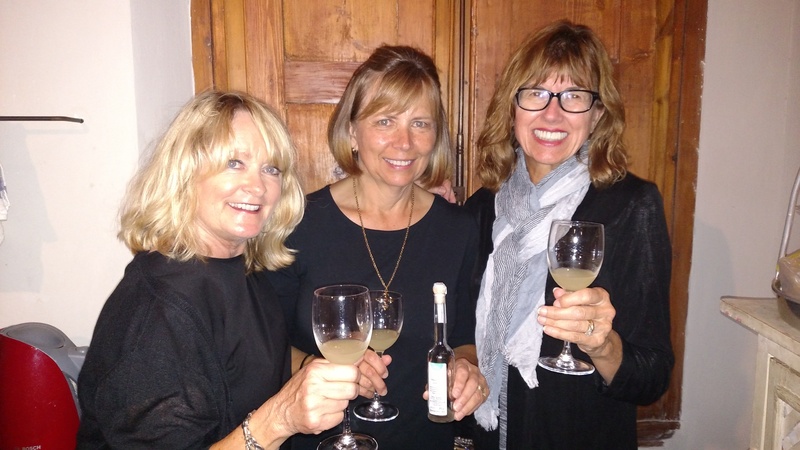 After dinner, Sylvia and Marilyn served us Limoncino. Made only in Cinque Terre from organic lemons, Limoncino is reputed to be stronger and more flavorful than Limoncello, the more well-known Italian liqueur. This entry was posted in Italy 2015 on September 14, 2015 by debbie. 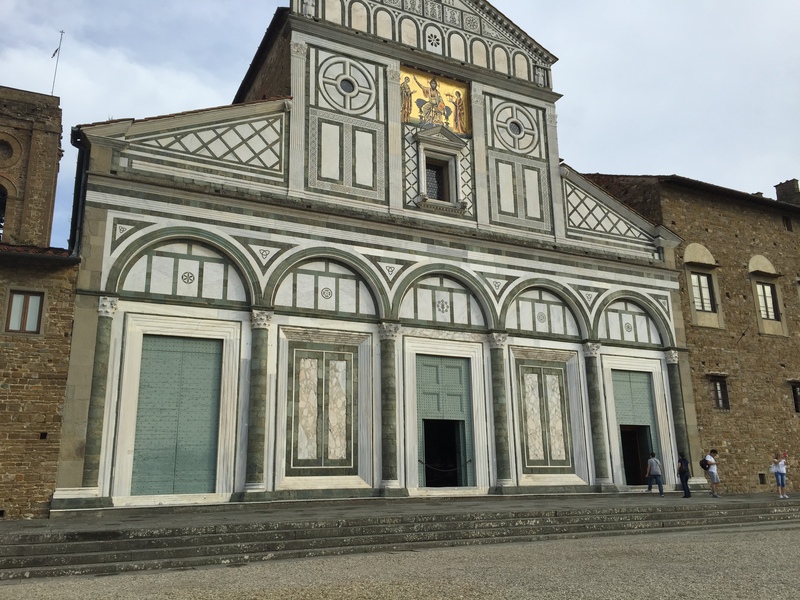 Atop a hill on the south side of the Arno river, the lovely 11th century San Miniato Church overlooks Firenze and offers a wonderful view of the city. 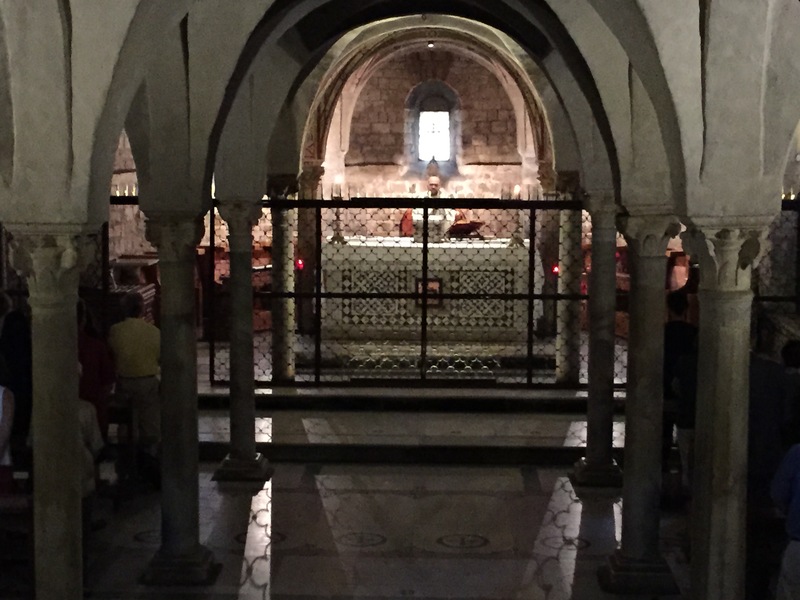 The church is named for St. Minias who, according to legend, was beheaded on the banks of the Arno river in A.D. 250 and then picked up his head and walked to the site of the church where he died. His remains are buried in the church. The outside of the church is beautiful green and white marble. The inside of the church is beautiful. We were able to walk around the different parts of the church. 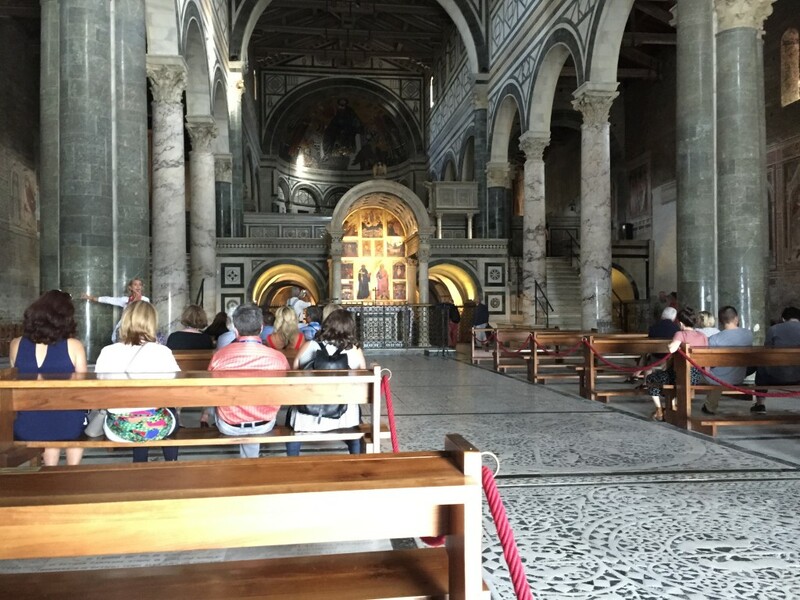 Just as I finished dropping some coins in the offering box in the Sacristy, a priest in white robes rang a bell and rushed in to the room to put on his vestments. Those of us in the room left and waited outside until he was finished. He was about ten minutes late to start the service, so he flew in and out pretty quickly. It was interesting to listen to his chanting the first part of the service. The church is surrounded by a huge 19th century cemetery. We were only able to explore part of it because it closed at 6:00. Walking back to our apartment, we passed the shop/museum of Alessandro Dari, master in jewelry arts, sculptor and musician. His work was amazing. We saw rings that had castles on top of them. 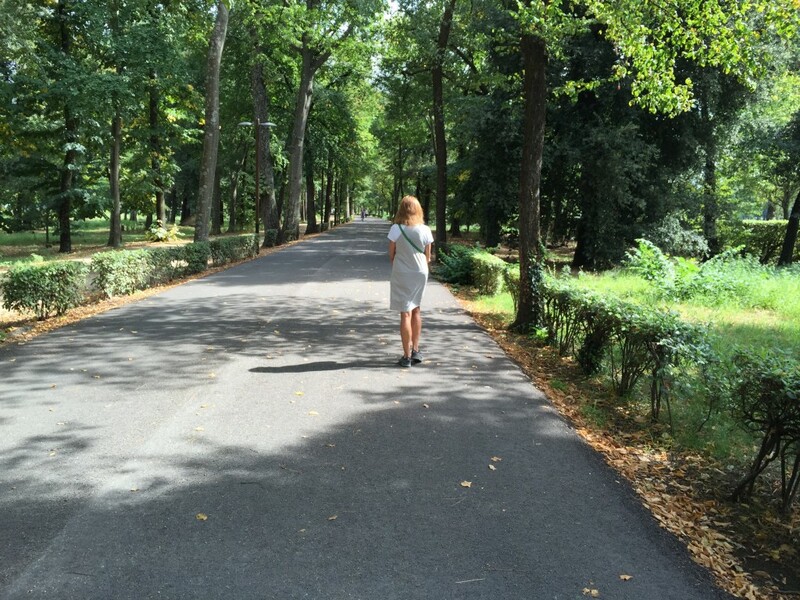 Today we took a break from city life and hiked to Parco della Cascine, the largest park in Firenze. Like almost everything else in Firenze, the park has a long history. 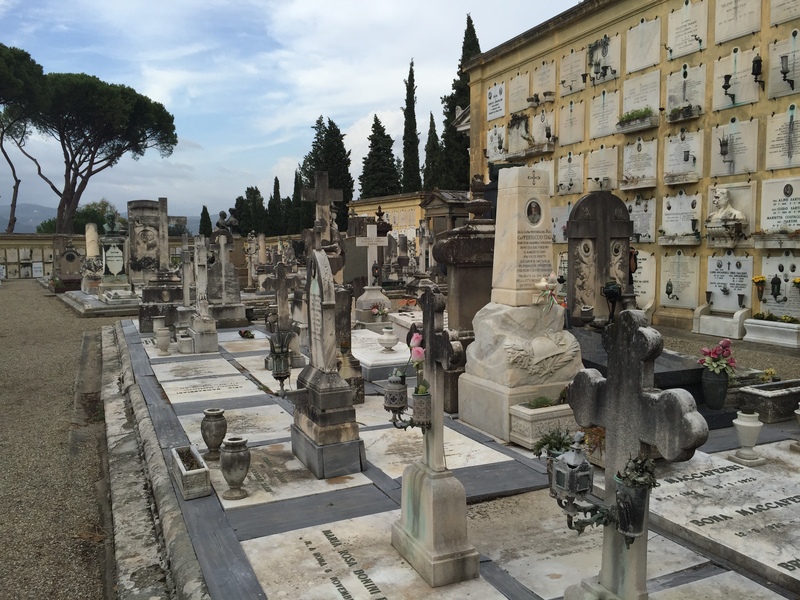 It began in 1563 as a hunting and farming estate for the Medici family. In the 18th century beautiful architectural features were added such as a pyramid-shaped ice house and lovely fountains. 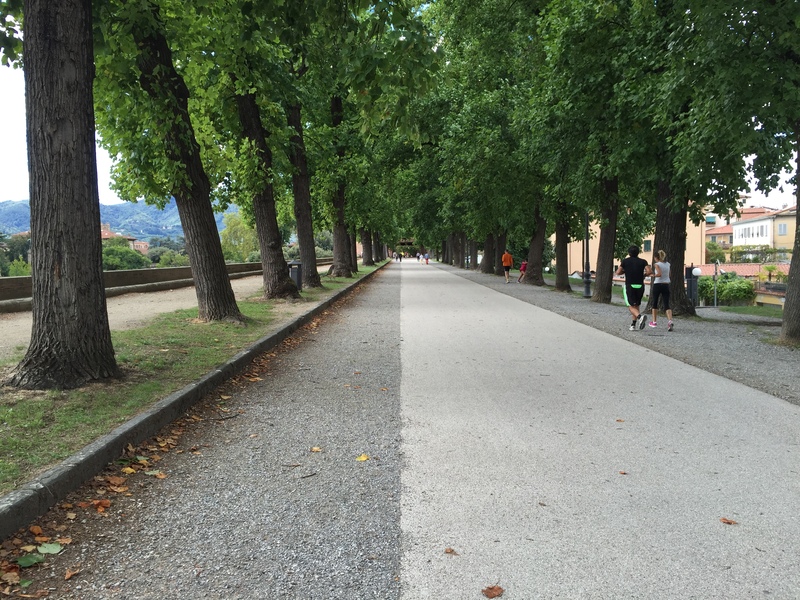 The long, narrow park borders the Arno river on its south bank. 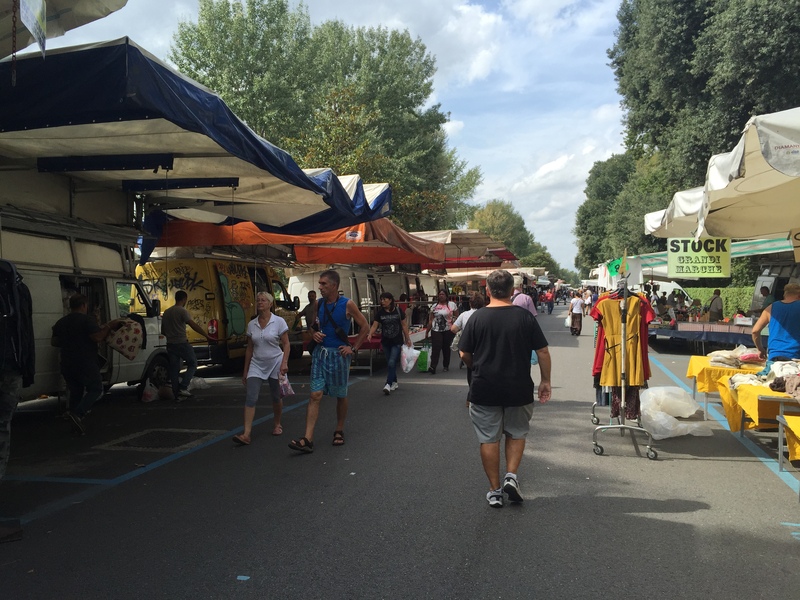 On Tuesday mornings, the park is home to the largest outdoor market in Firenze. Although we got to the park as the market was closing, we got a taste of what it offered-pretty much everything. Almost a kilometer long, it seemed to go on forever. 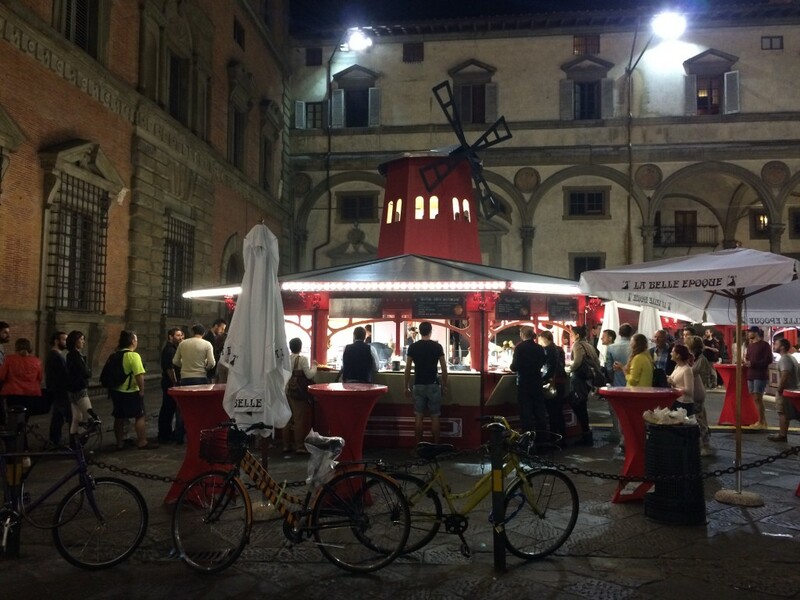 It is convenient for Florentines to get most of what they need in one place at the markets. 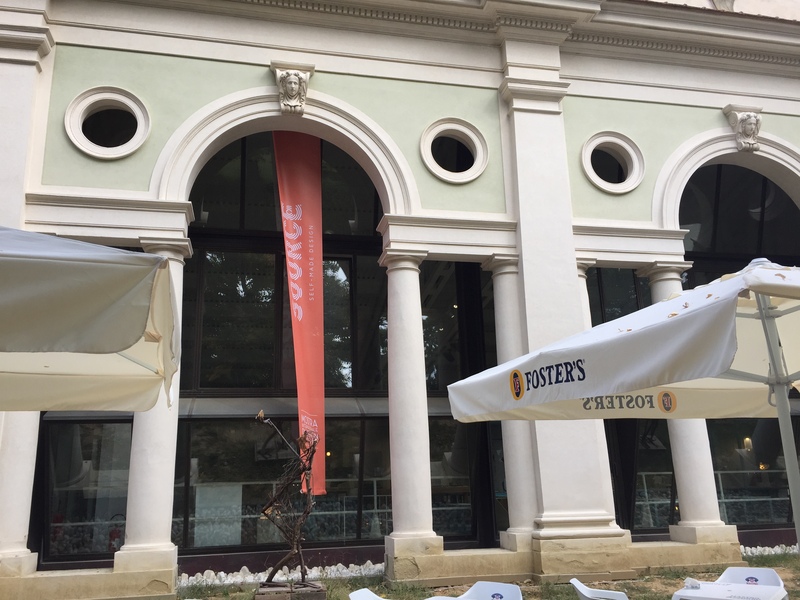 The Cascine market was definitely for locals, not tourists. We didn’t see one mini-David statue or fridge magnet. 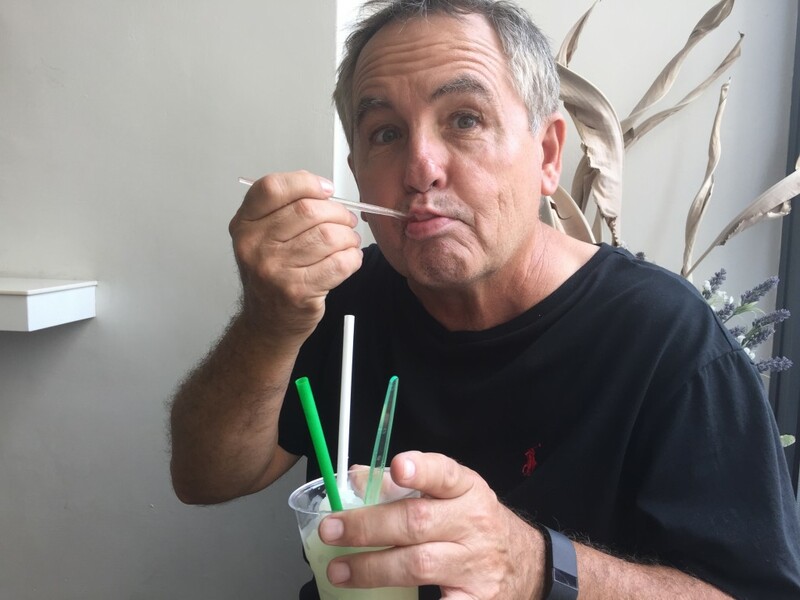 On our way home we found a shop selling limone granitas, our new favorite Italian treat. 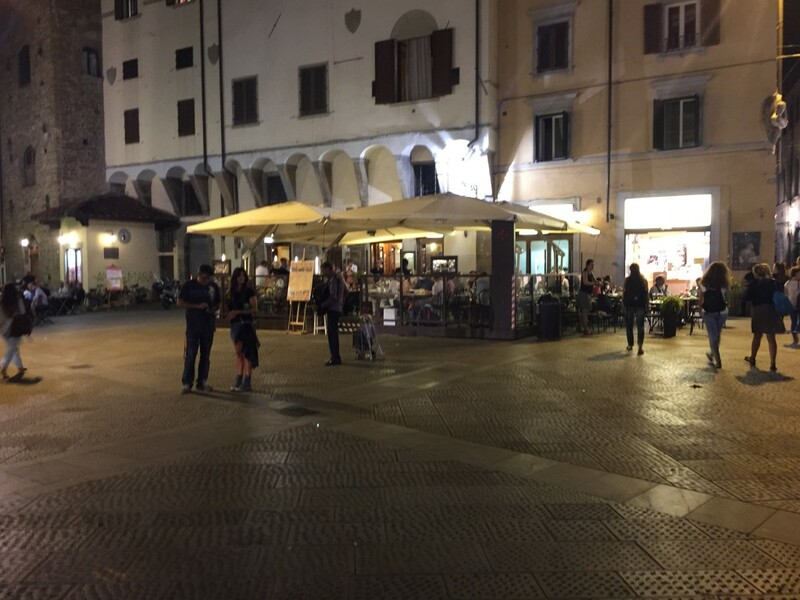 The near-by Piazza di San Pier Maggiore comes into its glory at night. We have walked through this modest, little piazza many times during the day and never gave it much attention. When we walked through it tonight, we felt like we were in a different piazza; dining tables, candle light, street singers and people everywhere. This entry was posted in Italy 2015 on September 15, 2015 by debbie. 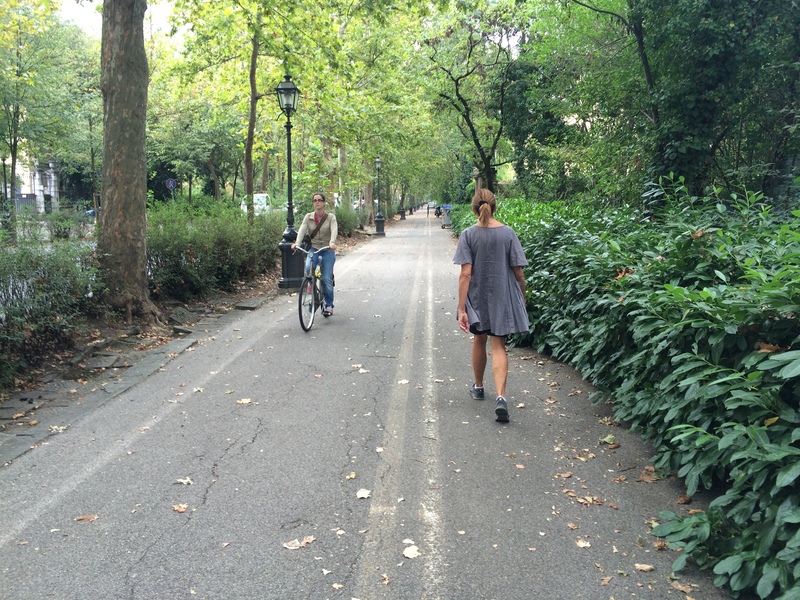 We hit the city park jackpot today with our walk to Giardino di Villa Strozzi, located on the southwest side of Firenze. Tidier and greener than the other two parks we visited, this one has beautiful pathways, benches and play spaces for kids and dogs. About two miles and a hundred steps up from our apartment, the park provided a perfect spot for a lovely view of the city. Seeing open doors on an interesting building in the middle of the park, we peeked in and were delighted to find an Italian design exhibit. Although the exhibit wasn’t open until the next day, the director welcomed us and invited us to look around. 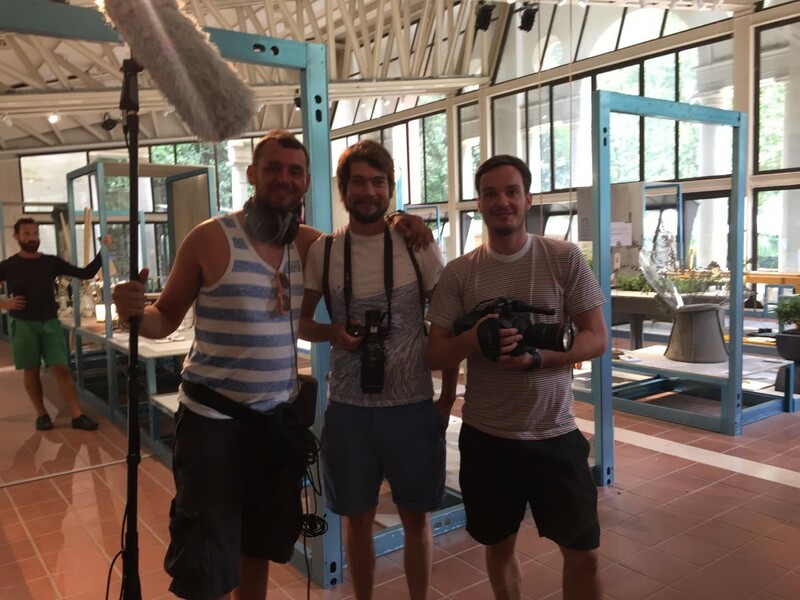 We met an interesting group of young film makers from England and Germany who were documenting the exhibit. A few years ago, they formed a company, Tell Us Your Stories, to identify and tell positive stories that inspire people to build bridges and live in harmony. 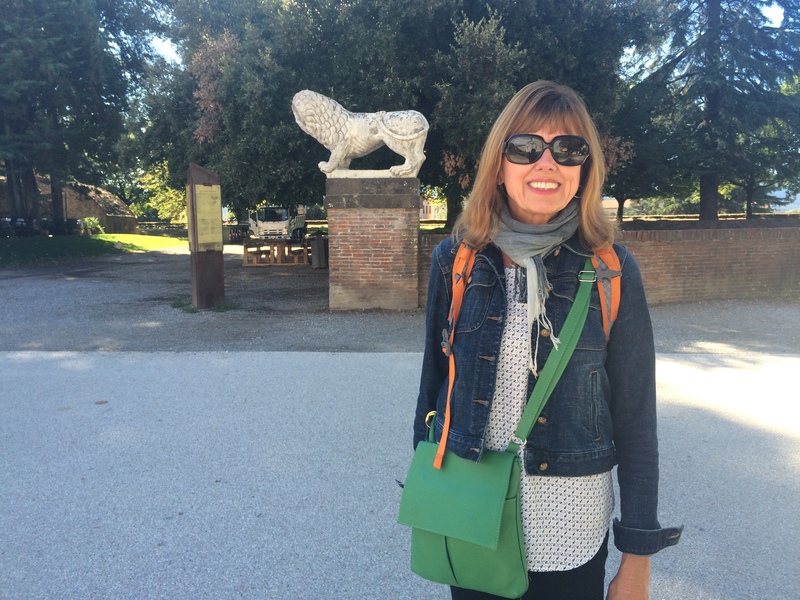 I had a fun Italian encounter before we went for our walk. 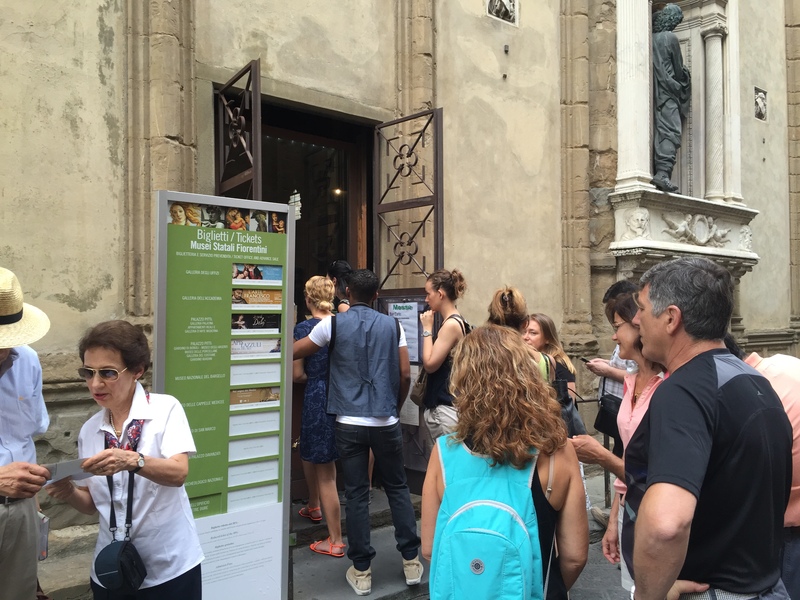 After getting advance museum tickets at the Orsanmichele ticket window, I answered questions from a number of people standing in line behind me about what tickets were available and how to purchase them. The people were Italian and knew about as many English words as I know in Italian, but with the help of gestures and pointing to signs, we were able to communicate just fine. Vogue Fashion Night Italy was in Firenze tonight. I have never seen so many very thin, very well-dressed people in one place before. It was a great people-watching night. Photographers and a huge entourage followed a woman in a green dress. I found out later she was Franca Sozanni, editor-in-chief of Vogue Italy. 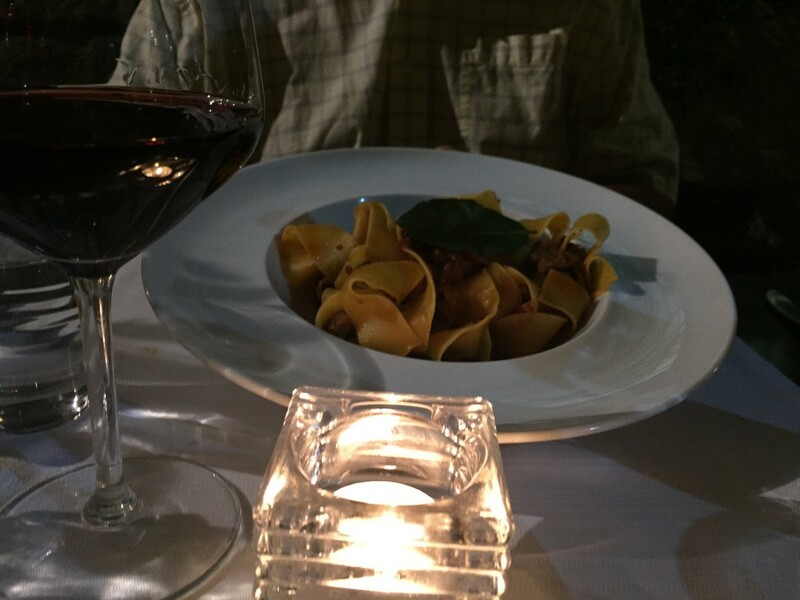 Paul ordered pasta with wild boar sauce, a Tuscan specialty, for dinner tonight. It was pretty good, not wild tasting at all. 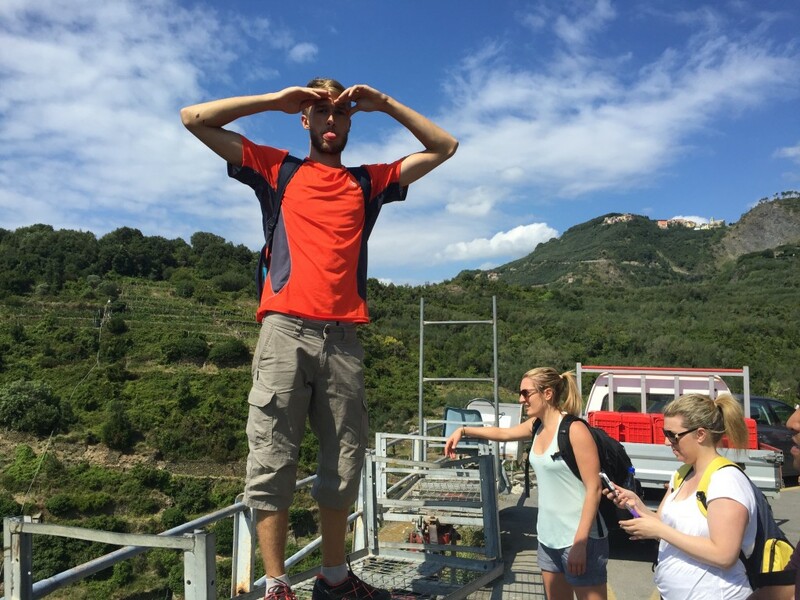 This entry was posted in Italy 2015 on September 18, 2015 by debbie. Today was going to be a nothing day-do some laundry, go for a little hike and get ready for our trip to Milan tomorrow. But it turned out to be a great day. One of the best parts of spending extended time in another country is the opportunity to have unplanned-for experiences. 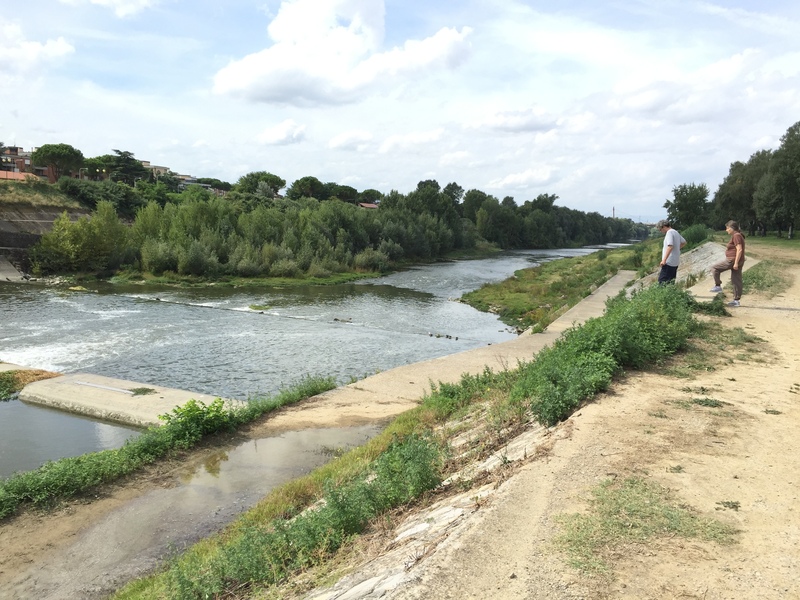 Paul and I headed south of Firenze today to walk in a new part of the city and soon unexpectedly ourselves on a beautiful walking and biking path. 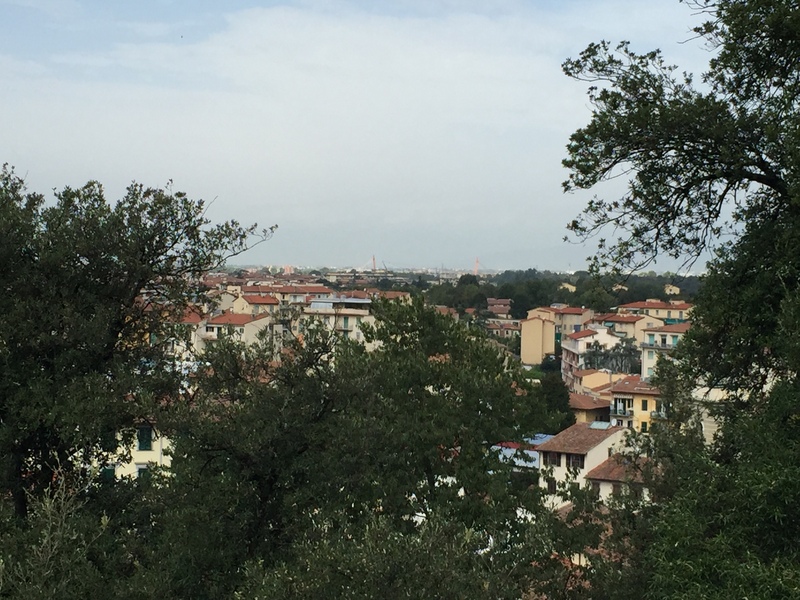 We walked by beautiful homes and a huge sports complex and ended up at Piazalle Michelangelo, the beautiful piazza that overlooks Firenze. There was a market in the piazza, so we had a little treat before continuing our walk. A wedding party made a stop at the market. 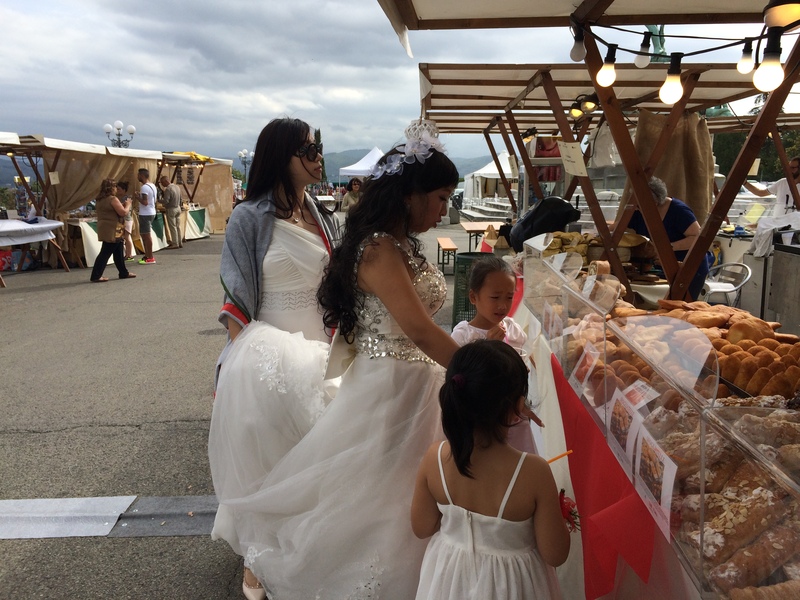 Brides show up in the most unexpected places in Italy. On the way home from our hike we stopped at our neighborhood market, Sant’Ambrogio for lasagna. 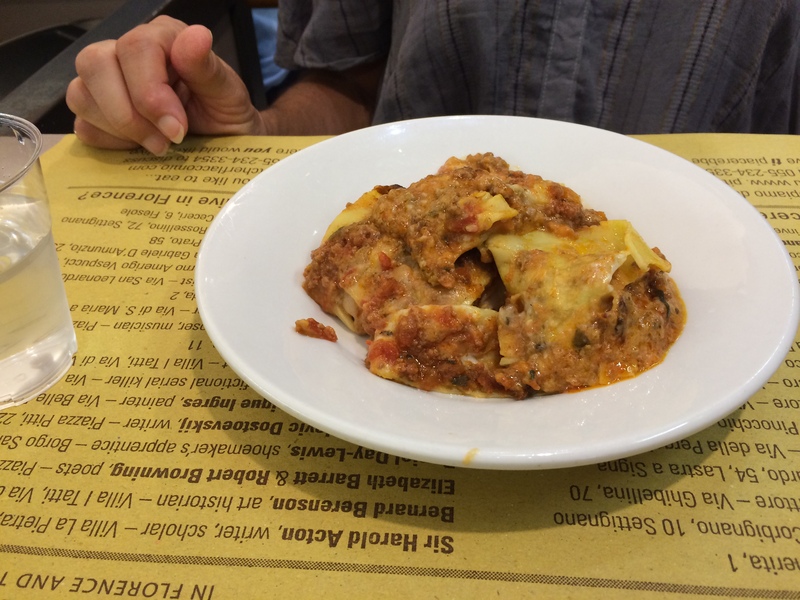 Our friends’ cooking class chef had recommended it as the best lasagna in Firenze, and we were not disappointed. Tonight we wanted to sit outside and have wine and a starter for dinner. 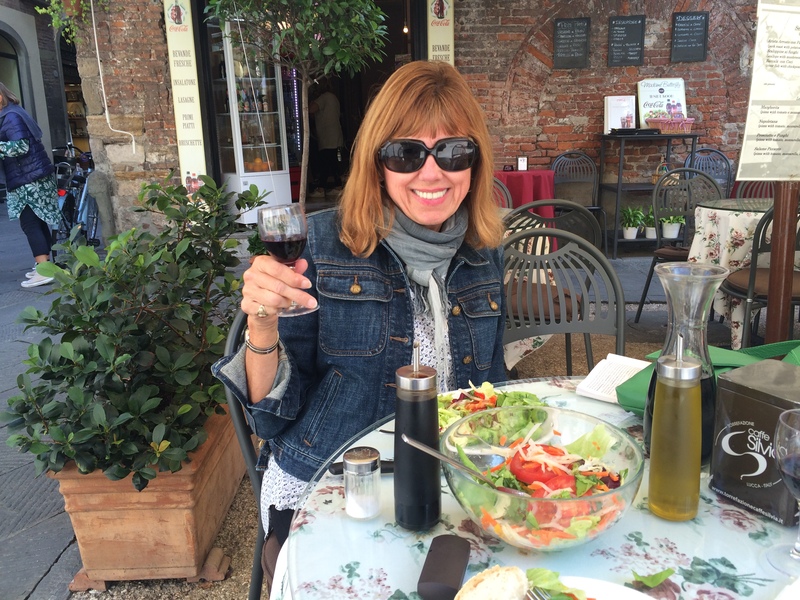 After exploring some different areas, we found a wonderful place that specializes in farm to table food and wine from Sicily. We sat outside, on the street, and had a wonderful bottle of wine and a starter of meat, cheese, potatoes, artichokes and tomatoes from the southern Italy. 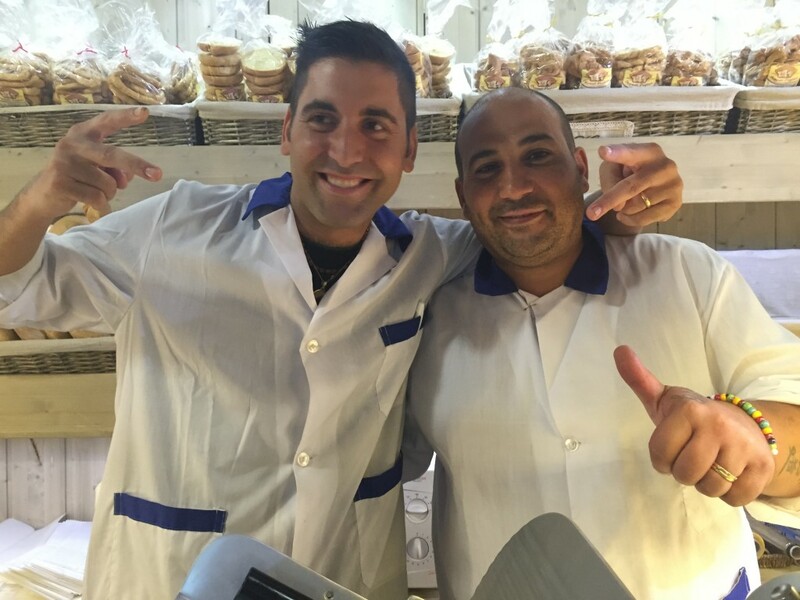 And to cap off our unexpectedly delightful day, the owner of the gelato shop where we make our nightly stop proclaimed us “true Florentines” when we walked in tonight. 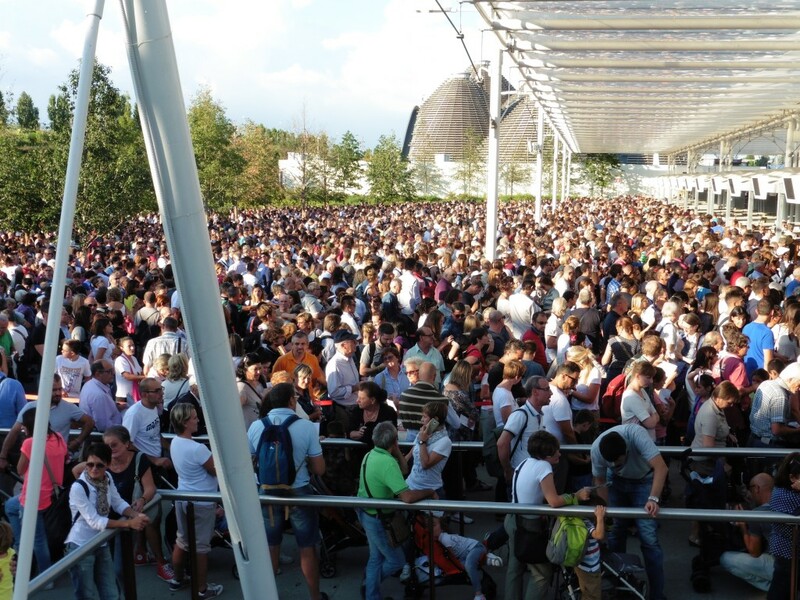 Two high-speed trains, four metros, and a lot of steps took us to Expo 2015, “Feeding the Earth, Energy for Life”, in Milano (Milan) and back. 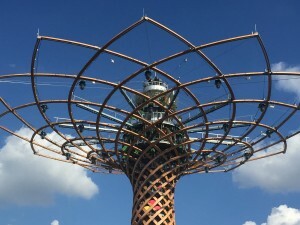 Never having been to Milano or a Universal Exhibition (world’s fair), we were excited for this adventure. A Universal Exhibition occurs every five years in a different country. Thanks to previous world fairs, we have the Eiffel Tower, St. Louis Arch, and Seattle Space Needle. 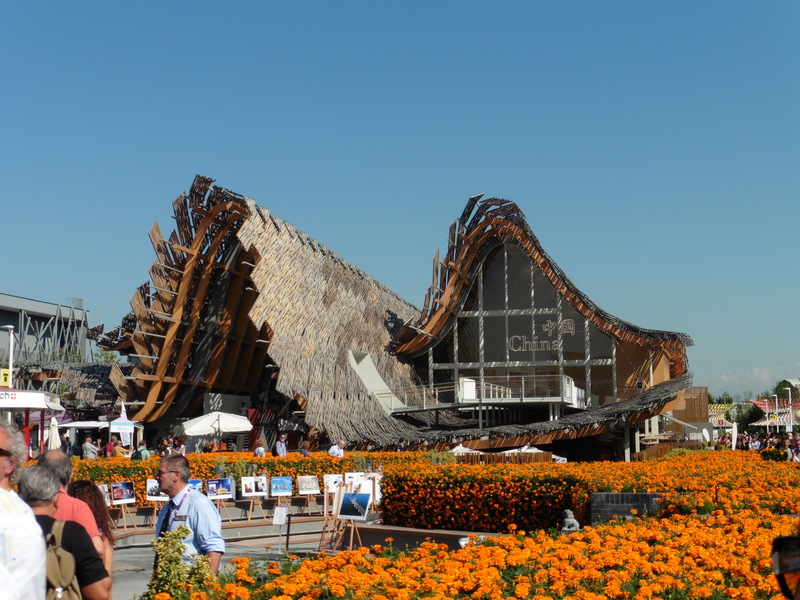 Italy’s Expo 2015 hosted145 countries on the 490-acre site. 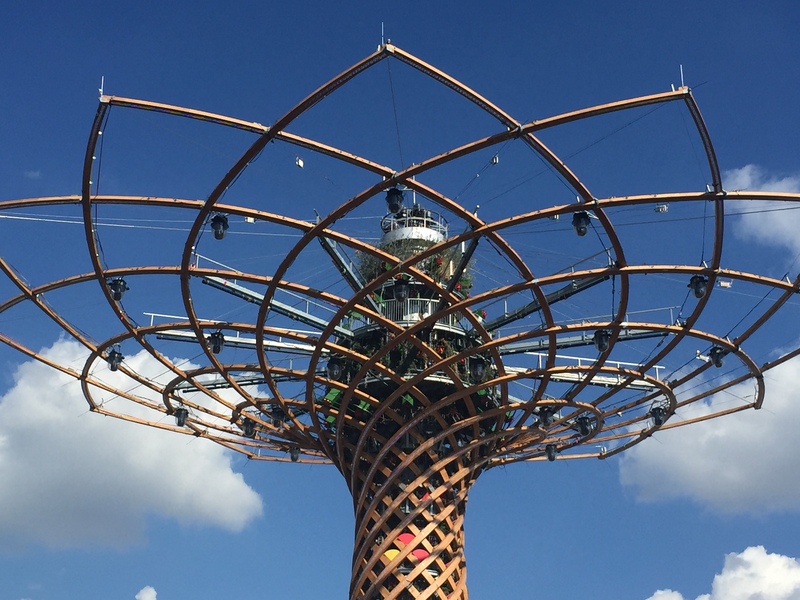 An Expo representative in Firenze told us the best pavilions to visit and which metros to take from Milano to the expo site. 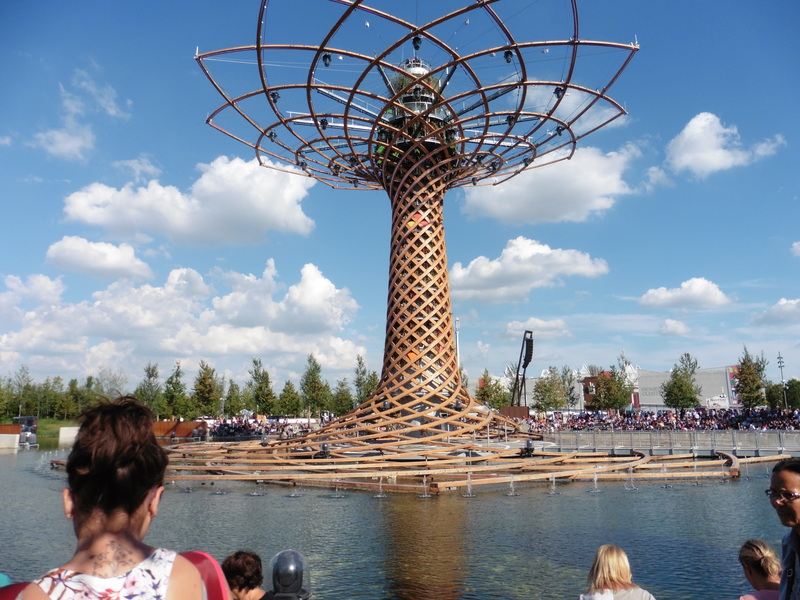 The Tree of Life, the symbol for the Italian Pavilion, is a tall wooden structure surrounded by water jets in the middle of a lake. Periodically, Italian music plays, the structure lights up, flowers bloom out of the stalk and water shoots up in time to the music. The good news is we experienced something unique to us, visited a new city, and had the satisfaction of figuring out a new metro system. 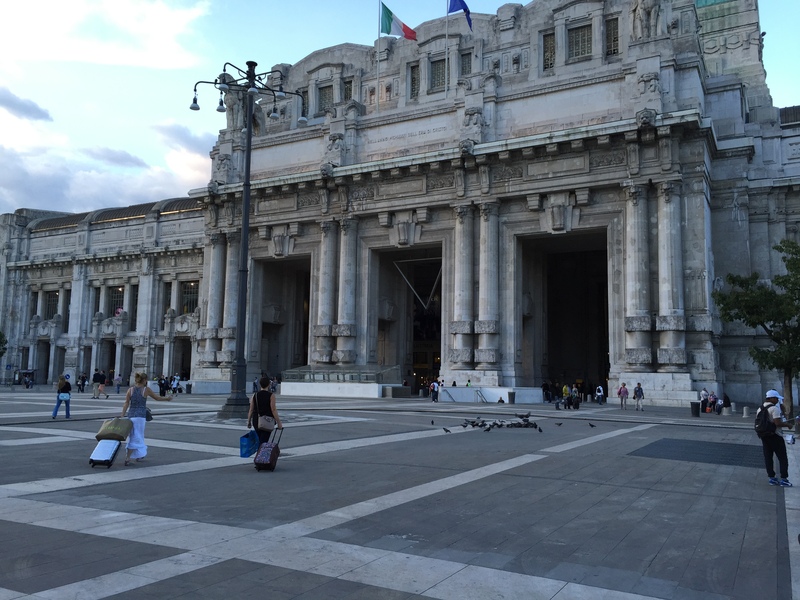 Although we didn’t see much of the city, we did see the beautiful Milano train station. 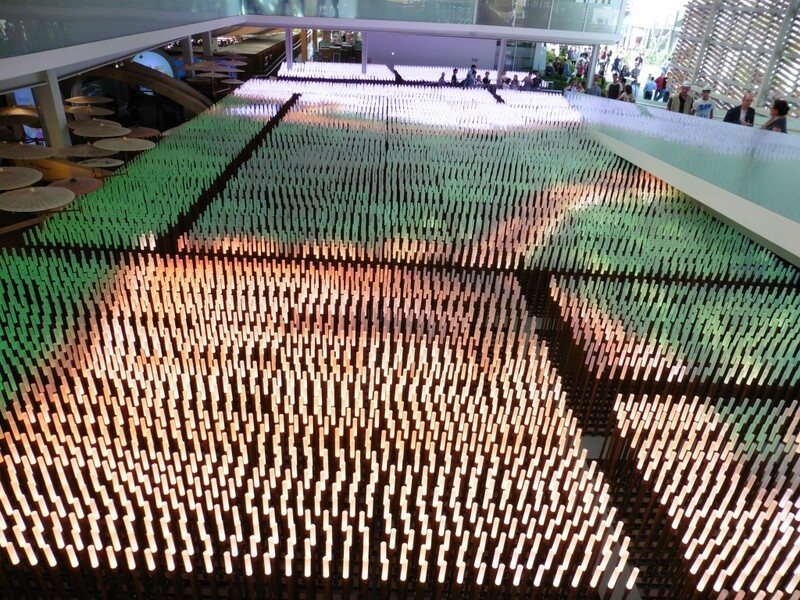 We also saw some interesting exhibits, all focused on sustainable energy and feeding the planet. The Chinese pavilion was one of the largest and most impressive. 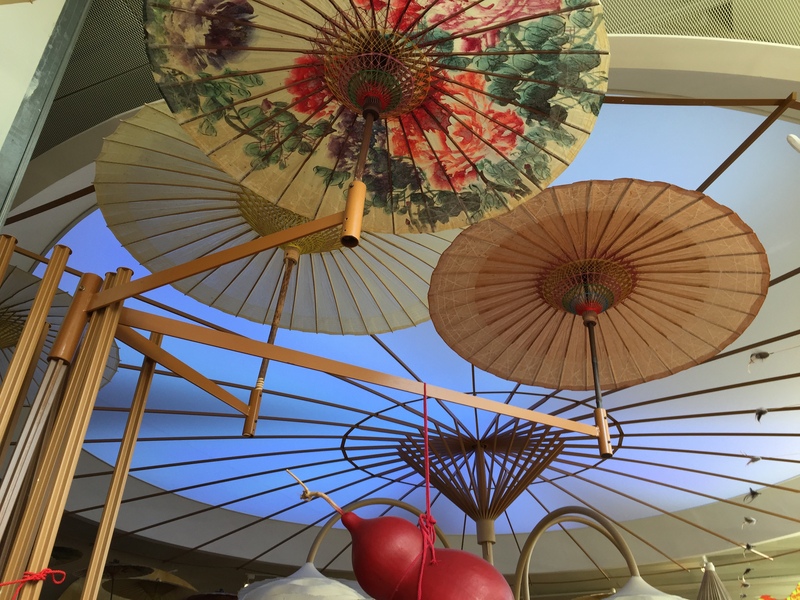 Beautiful displays of Chinese art and crafts lined the walkway into the exhibit. At the end we walked on a ramp around a huge light display that changed colors and showed images of flying birds and galloping horses as music played. 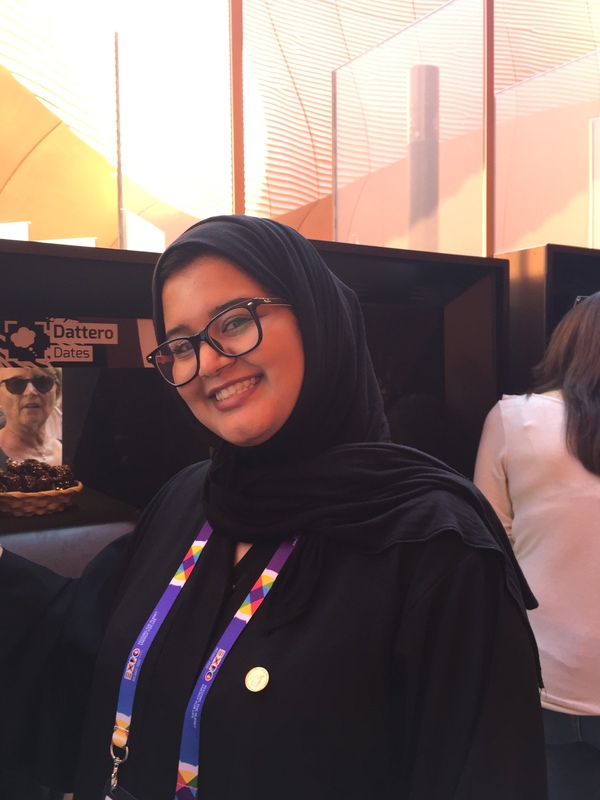 We were the only English-speaking visitors at the United Arab Emirates pavilion, so we had our own guide to introduce us to the displays. The UAE pavilion used high-level technology to tell their story. Along the entry to the exhibit were touch screens using holograms in both Italian and English to present the ecological challenges the exhibit would address. We saw a 180-degree movie that featured a young girl traveling back in time to learn the importance of water to her country. At the climax of the movie, the wall opened and we were invited to walk into another room that had virtual images of the characters from the movie talking with us. The UAE will host the 2020 World’s Fair in Dubai. 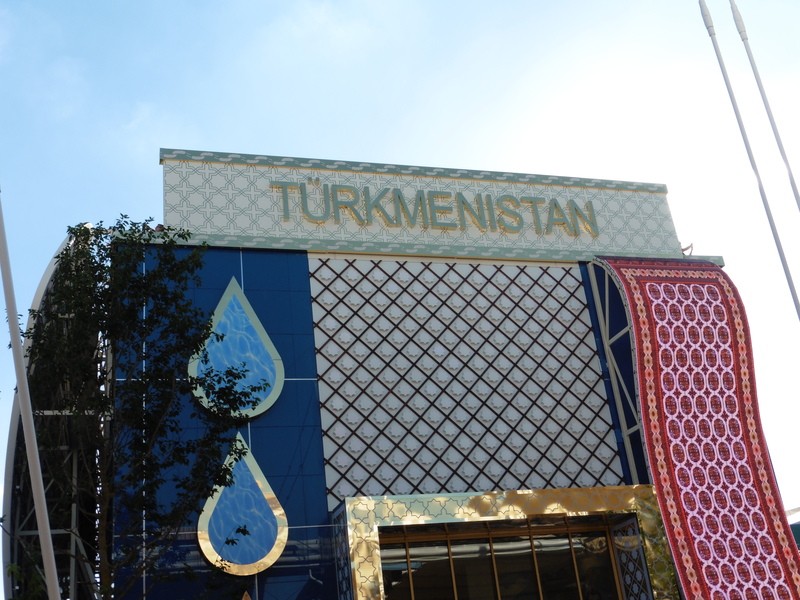 The Turkmenistan exhibit was one of the smaller pavilions, but we wanted to see it because a friend’s daughter was in the Peace Corps there. The bad news is the expo was over-populated. We stood in long lines everywhere; an hour to get into the Chinese exhibit and an hour and half to get into the UAE exhibit. We felt like we were experiencing the challenges of expanding populations that the exhibits were addressing. In spite of the challenges, it was a great day, and we are glad we went. 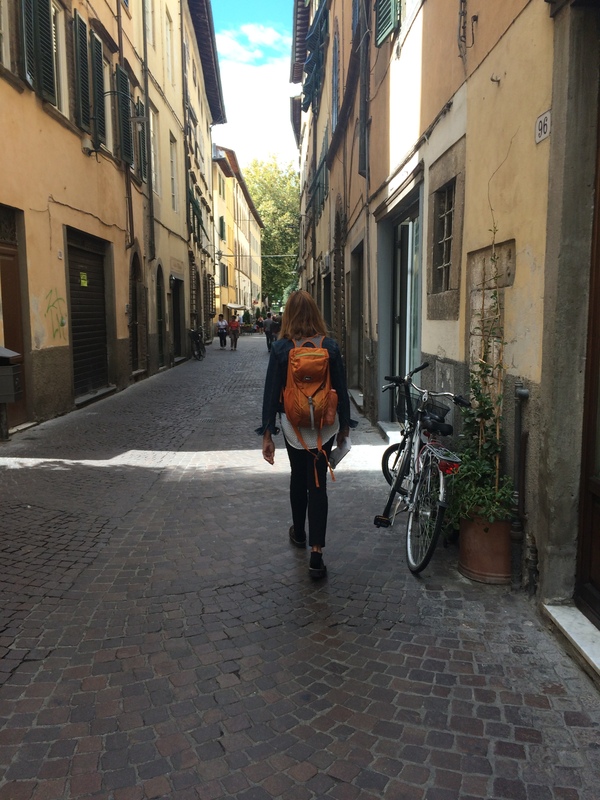 Walking home from the Firenze train station, we thought the local piazzas were not as congested as we had thought before our trip to Milano. 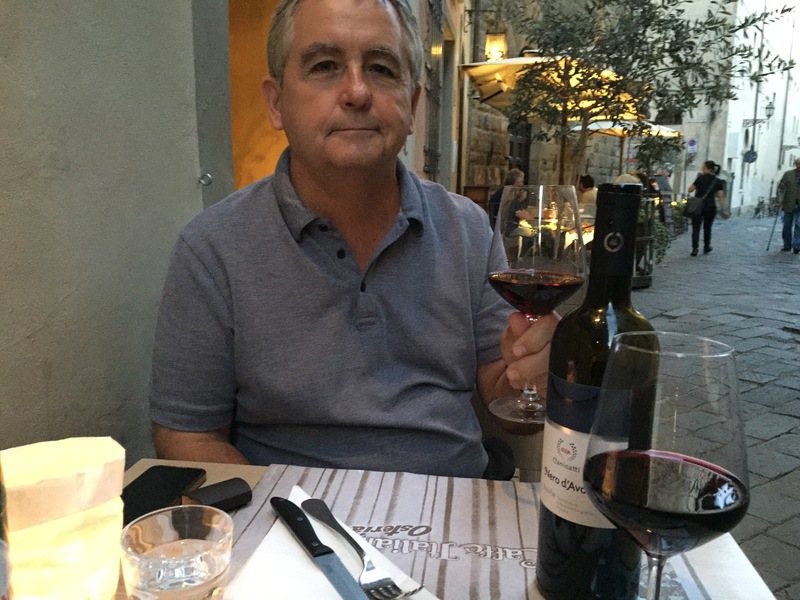 The next day we hiked in a beautiful, quiet area of Firenze and enjoyed a leisurely Sunday lunch at one of our favorite Tuscan restaurants. 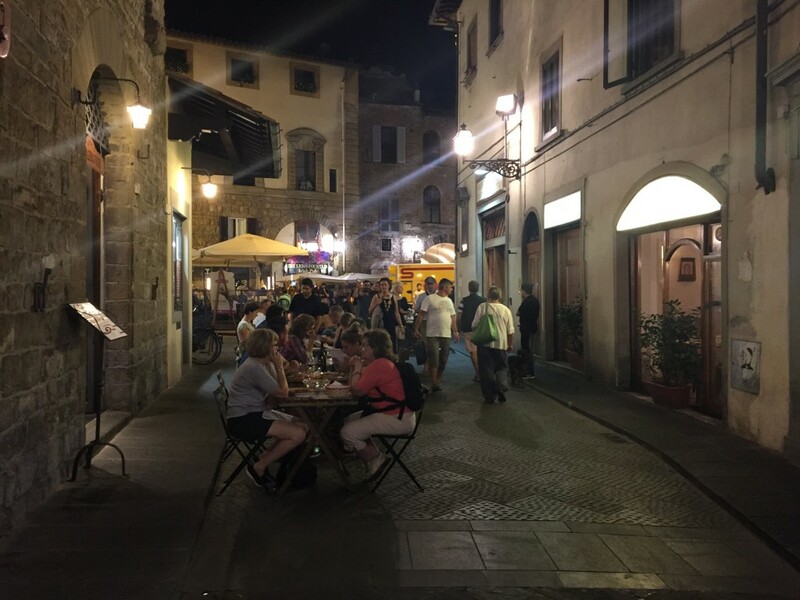 In the evening we strolled the area around the Duomo and discovered a three-day French market inspired by Paris’ Universal Expositions of the 19th and 20th centuries. It was a treat to be able to communicate with the French vendors. 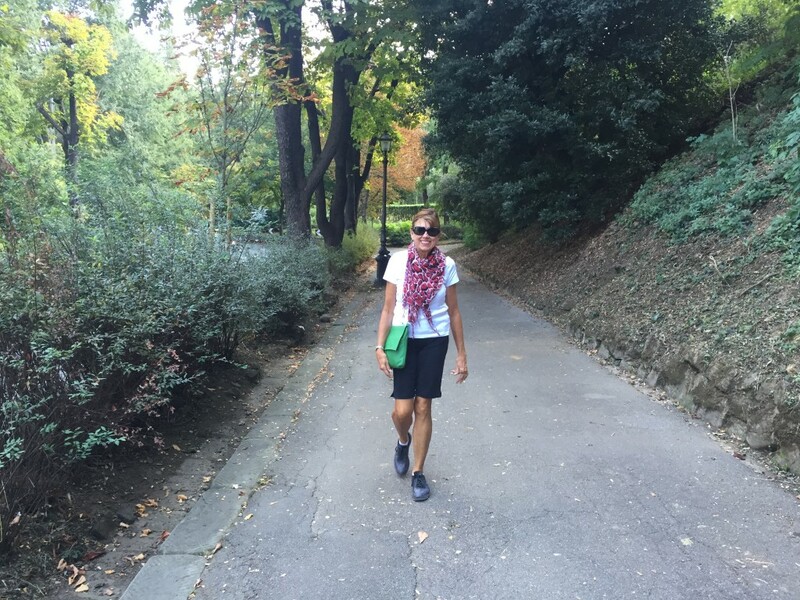 This entry was posted in Italy 2015 on September 20, 2015 by debbie. 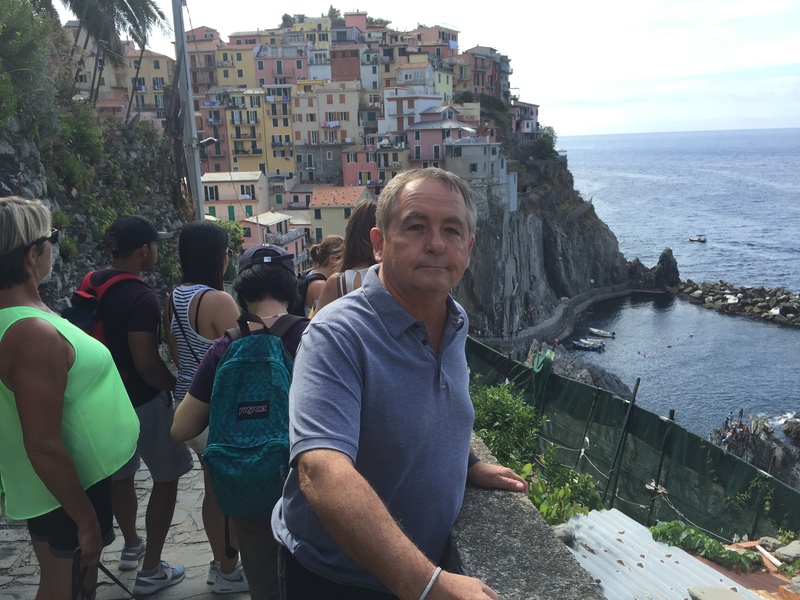 As we began our morning stroll to check out some recommended restaurants, we ran into Guido, who had rented an apartment to our friend when he was here visiting. We had brought five Brooks Brothers shirts from the US for Guido because they are much more expensive in Italy. Guido shared some great insider information about the soccer game we had attended earlier. 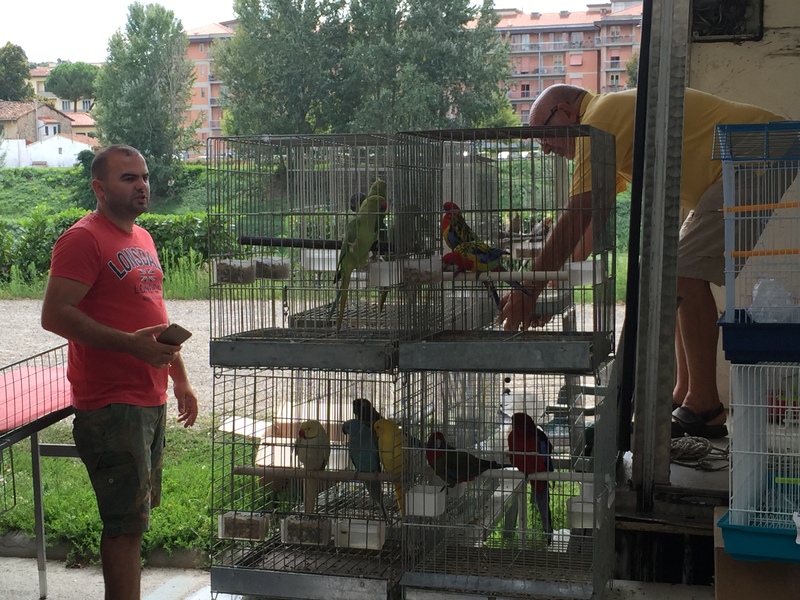 While chatting with Guido, we saw the elderly and very Italian Mr. Lombardi, the apartment caretaker, come outside. He speaks no English, but I was able to speak a tiny bit of Italian with him, and he started smiling and shaking my hand. This little encounter made us feel part of the neighborhood. 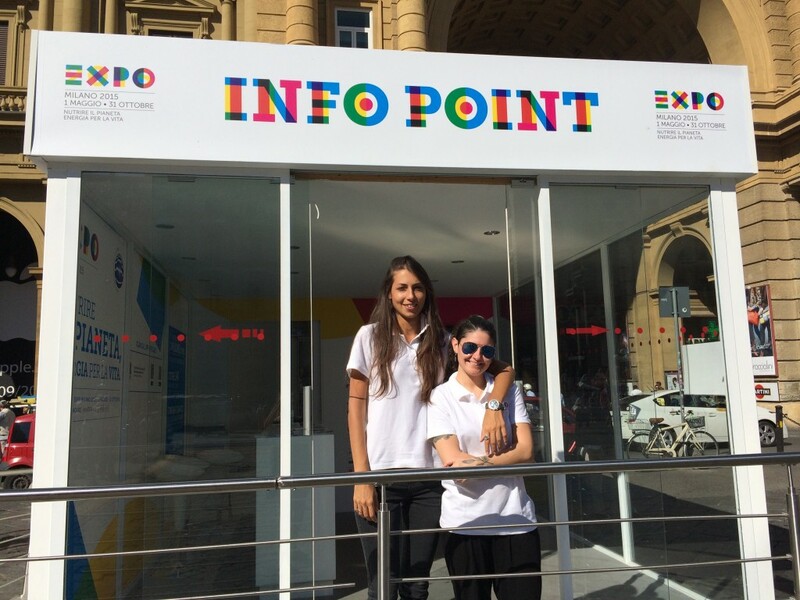 We stopped at the Expo 2015 booth in Piazza Republica to thank the young women who had helped us with our tickets and using the Milano Metro. It was fun to share our Expo impressions with them. As we were looking at the menu outside Sostanza, one of the restaurants on our list, we chatted with a couple from the US whose son had recommended the restaurant to them. While we were talking with them, a young man stopped by because he had seen a YouTube video about the restaurant twelve years ago. As we were all waiting for the restaurant to open and comparing restaurant notes, two young Asian men stopped and asked us if it was a famous restaurant because so many people were standing outside of it. Luckily, we were able to make a reservation for tomorrow night. 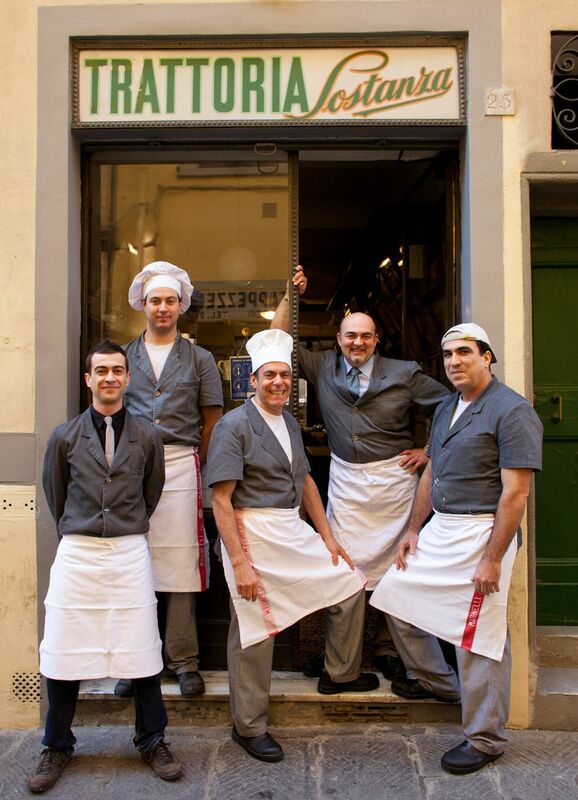 With our appetites whetted, we checked out Il Guscio, an off-the-beaten path restaurant on our list. It looked great and we were hungry, so we stayed for lunch. 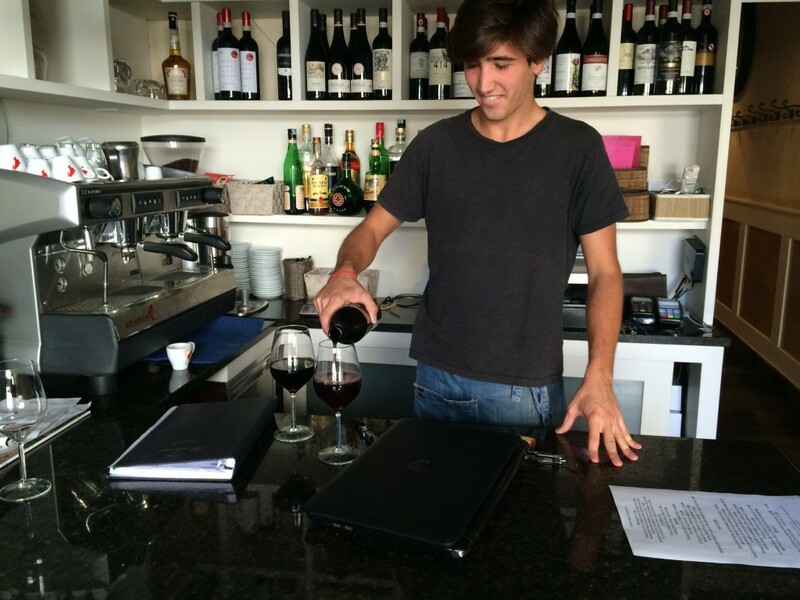 A delightful young man, the son of the owners, helped us with our menu and wine choices. The food, wine, service and karma made it a totally perfect lunch. 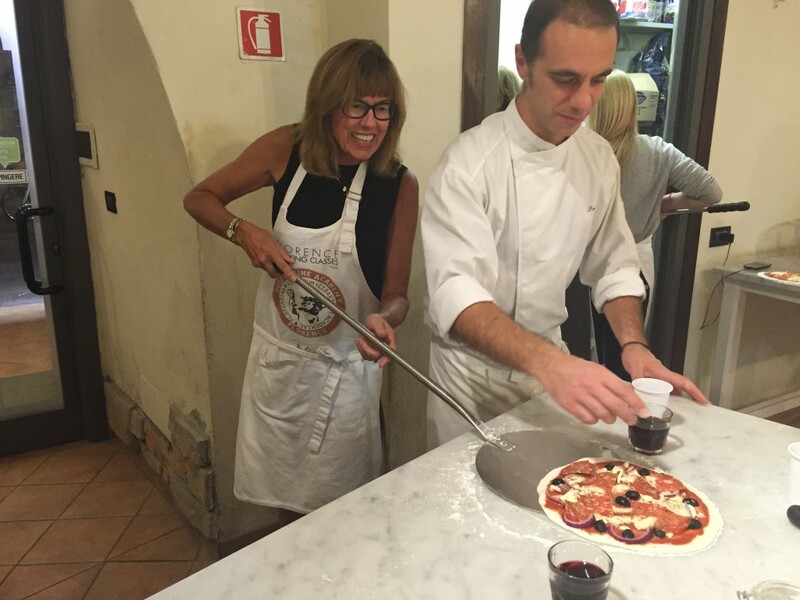 Tonight we went to a pizza and gelato cooking class. We connected with two couples who live in the same California county as our daughter. What are the odds of that happening? 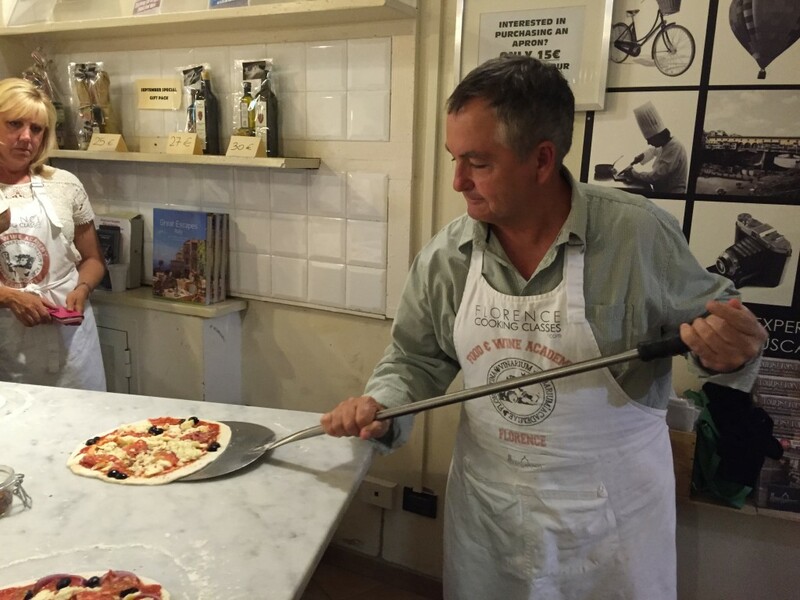 Paul makes great homemade pizza, but he has trouble getting it off the paddle and onto the stone, so we thought we might get some good tips. Since we have eaten gelato almost every day we have been here, it was fun to learn more about how it is made and what to look for in the best gelato. 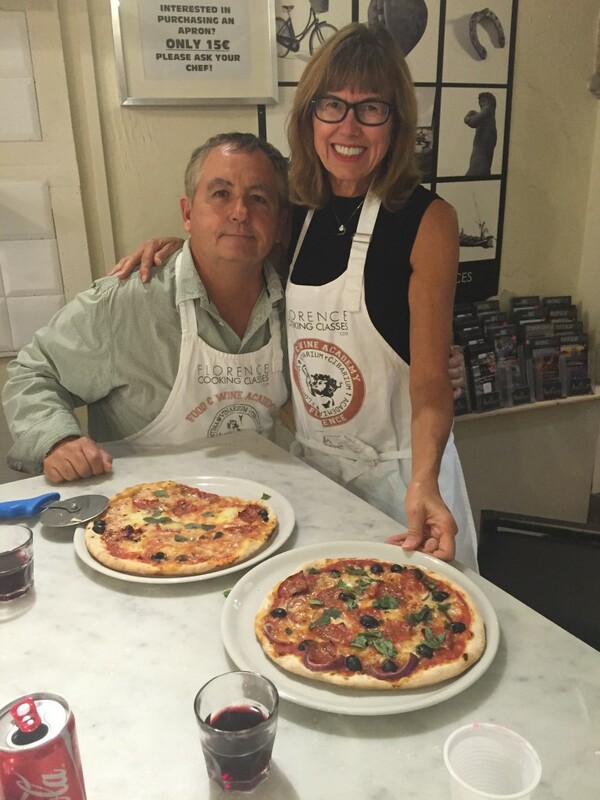 My main pizza-making take-aways were be gentle with the dough and jiggle to get the pizza on and off the paddle. The best part was enjoying our great pizzas. This entry was posted in Italy 2015 on September 21, 2015 by debbie. We enjoyed one of our best dinners yet in Firenze last night. 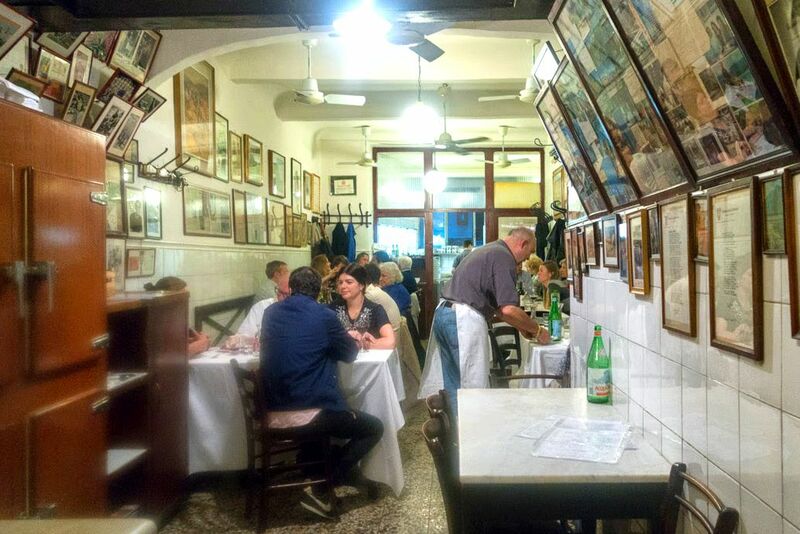 Trattoria Sostanza is a tiny restaurant with a big reputation. Everyone we talked to at the restaurant were there because someone had recommended it to them. Part of the charm of dining here is feeling like you are at a dinner party in someone’s home. We were seated with two other couples, one from New York City and one from Sao Paulo, Brazil. Connections we make with people from different places often amaze me. The young man from New York City had relatives living in Bemidji, our Minnesota home of thirty years, and the couple from Brazil had made many trips to Florida and loved it. We spent the evening sharing dishes and travel stories with each other. After researching what we should order, we decided on the butter chicken. Every review we read, said to order the butter chicken. 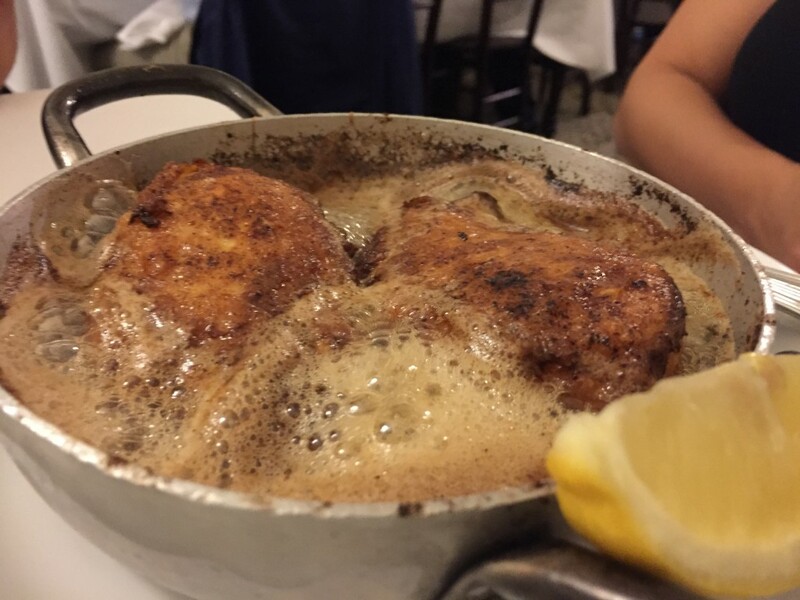 It came in a sizzling pot of chicken and butter and was amazing, unlike anything I have ever eaten. Every dish was delicious. 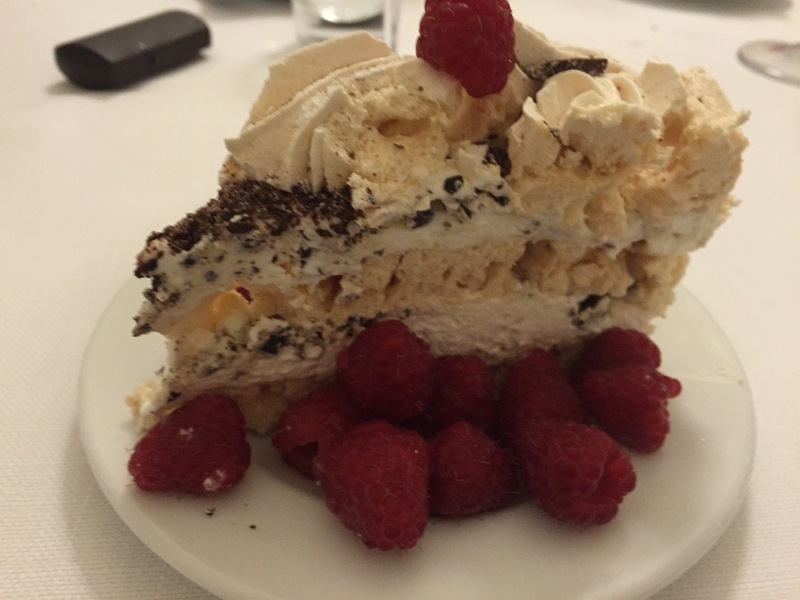 Dessert, a type of meringue cake with cream, chocolate and fresh raspberries was a perfect ending to our delightful evening. This entry was posted in Italy 2015 on September 23, 2015 by debbie. We went to lovely and serene Lucca today. About an eighty-minute train ride from Firenze, Lucca is completely encircled by a wall built in 1504. 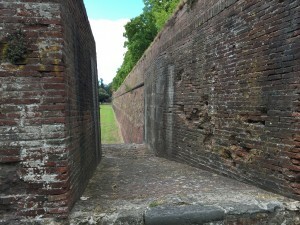 Originally built to protect the city, it is now used as walkway and park. From the train station just outside the city walls, we climbed some steps up the inside of the wall and emerged on the wide pathway on top of the wall. 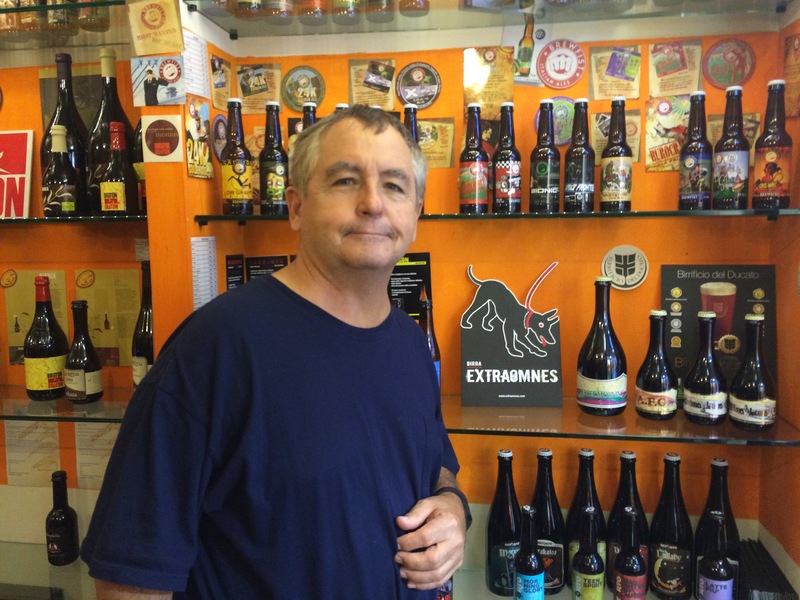 We explored the lovely little streets, and Paul was delighted to find a small shop dedicated to Italian craft beer. 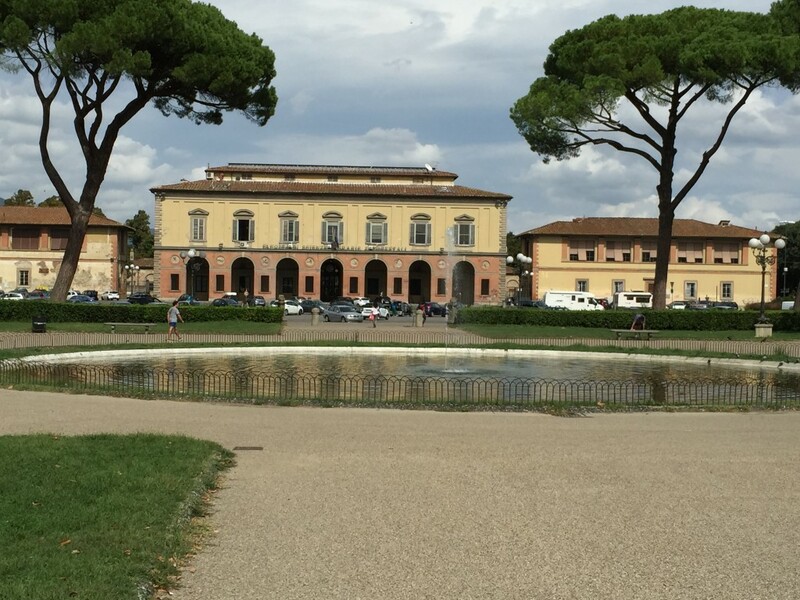 In addition to being a beautiful Italian hill town, Lucca is known for being Europe’s leadng producer of toilet paper and the home of Giacomo Puccini, great opera composer. 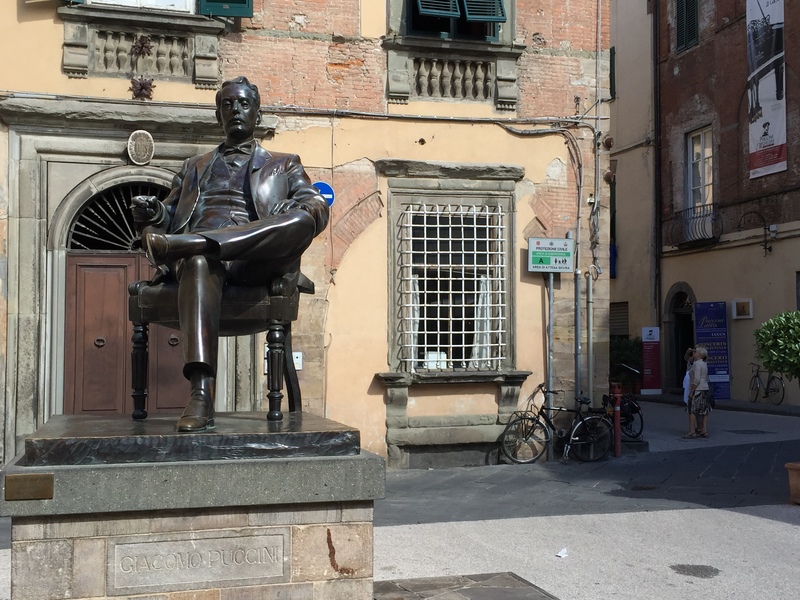 A statue of Puccini sits right in the middle of Piazza Citadella. His house, now a museum, is just up the street behind the statue. 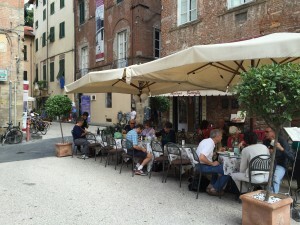 We ate lunch in a charming little restaurant next to Puccini’s house, overlooking the little piazza. 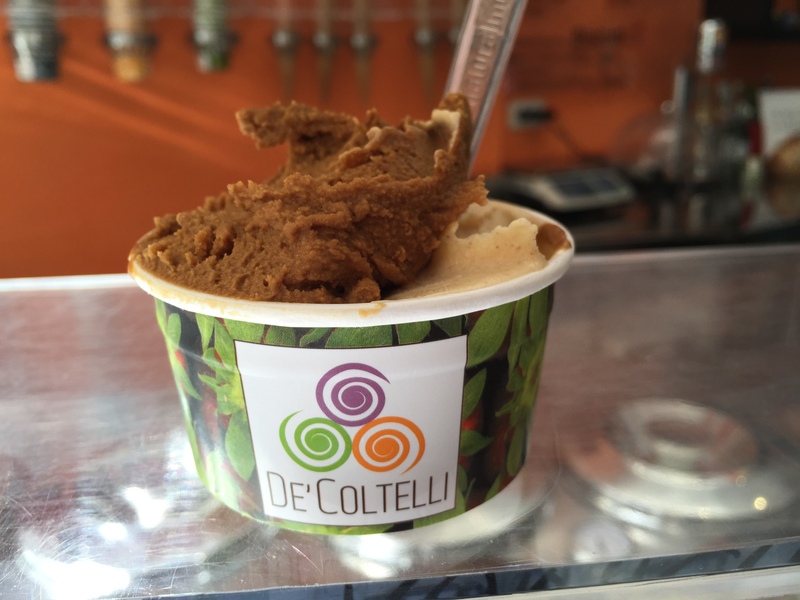 De’Cotelli, one of Rick Steves’ favorite gelateria, is in Lucca, so, of course we had to try it. I tried amaretto and caramel, and it was the best gelato I have had. 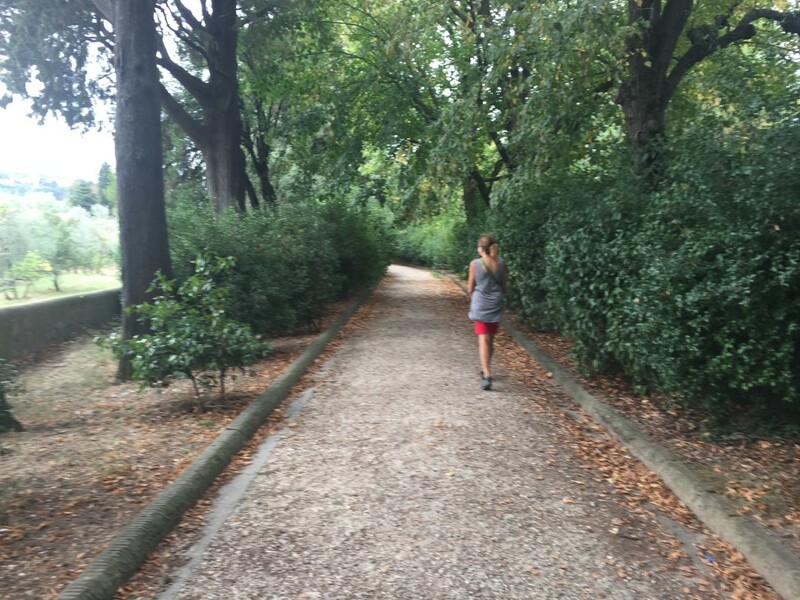 This entry was posted in Italy 2015 on September 24, 2015 by debbie.